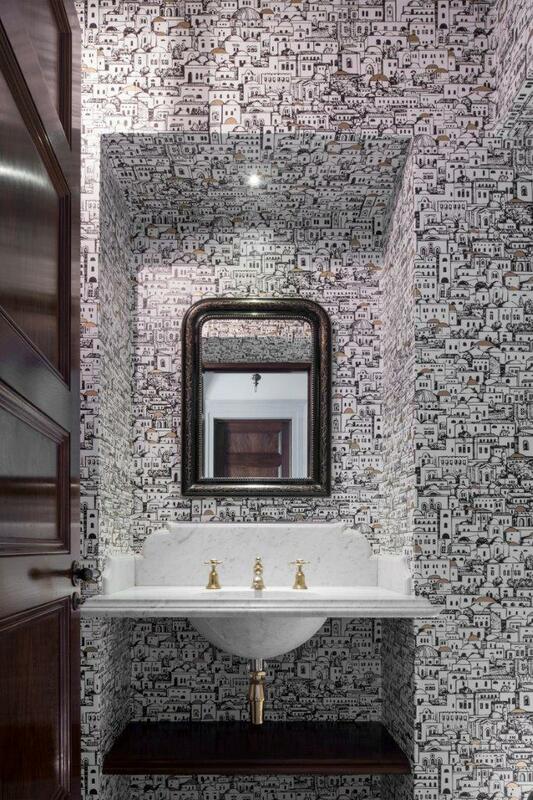 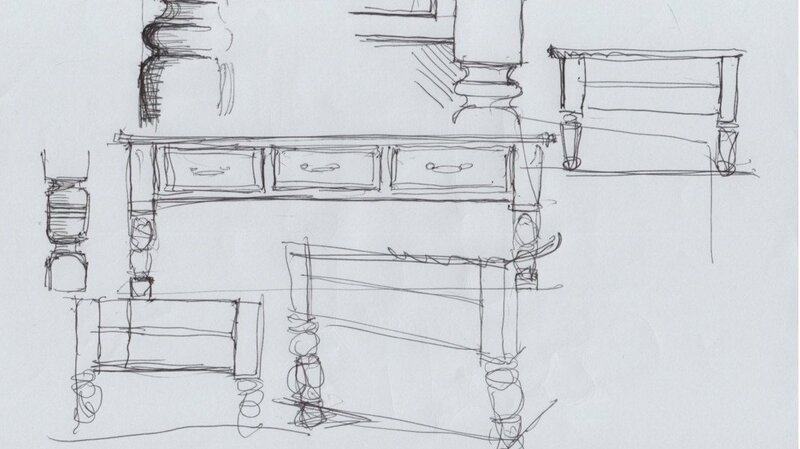 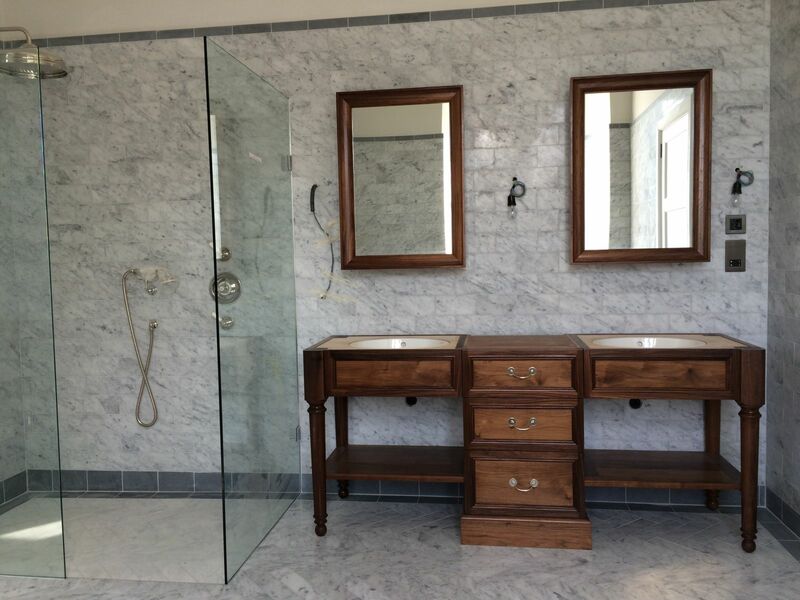 At Artichoke, we spend a great deal of time resolving and detailing the domestic layouts of our client’s homes. 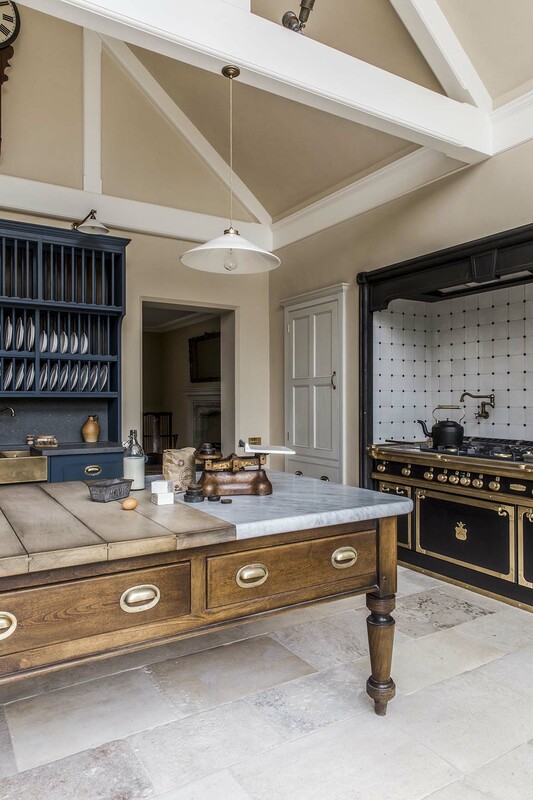 We never even consider what a country house kitchen will look like aesthetically until we understand completely how a space works practically. 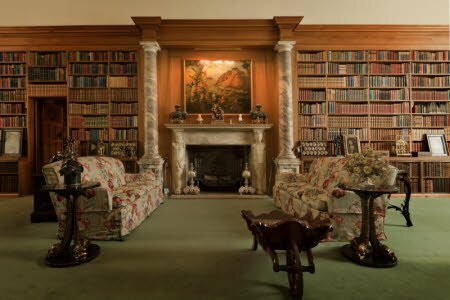 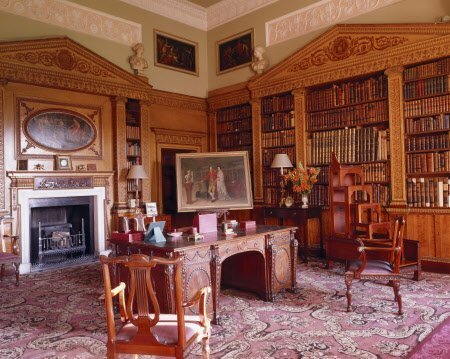 In the 18th and 19th centuries, the domestic back-end of an English country house was largely managed by a team of servants who had set zones of work to operate from. 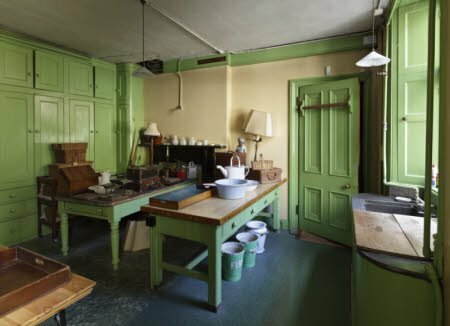 For example, the scullery maid worked in the scullery, the cook reigned supreme in the kitchen and the butler had his pantry. 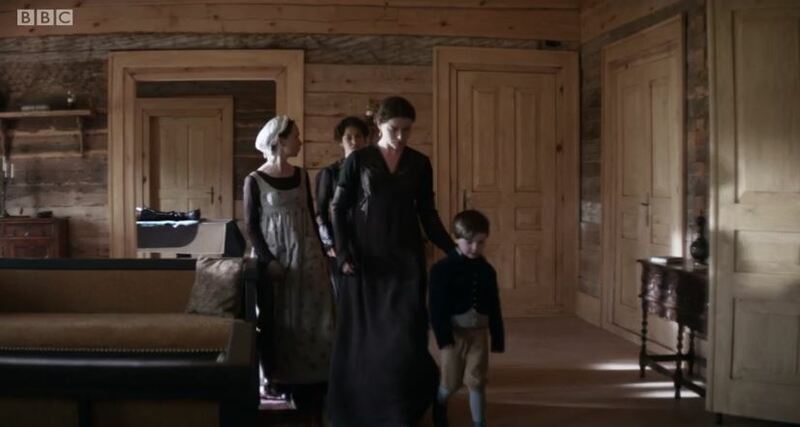 The upper servants were butler, housekeeper, cook, valet, ladies maid and governess, and below them socially were footmen, housemaids, kitchen, scullery, laundry and dairy maids. 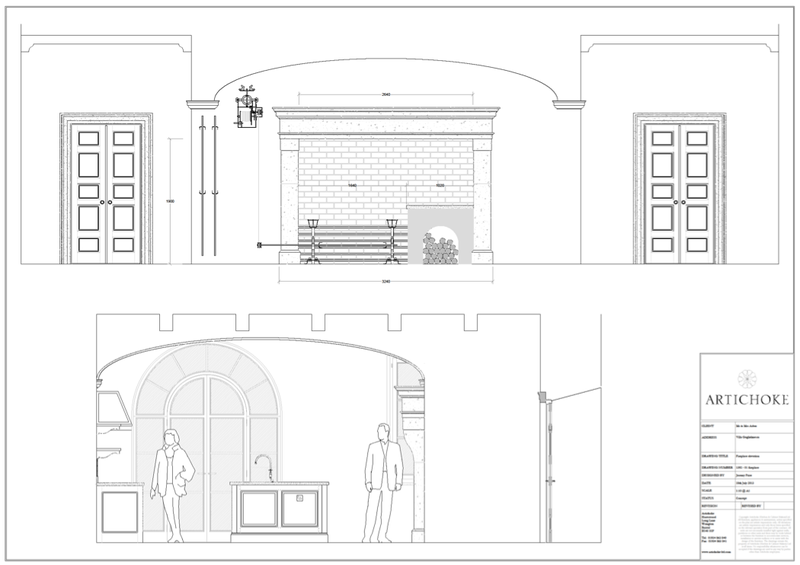 Anyone who has watched Downton Abbey will have a understanding of the structure. 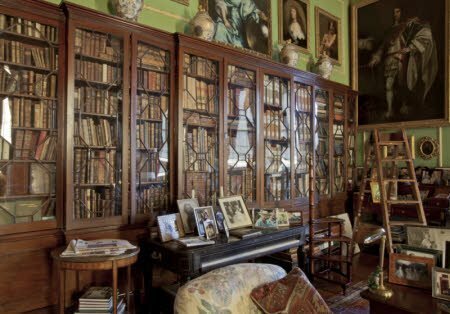 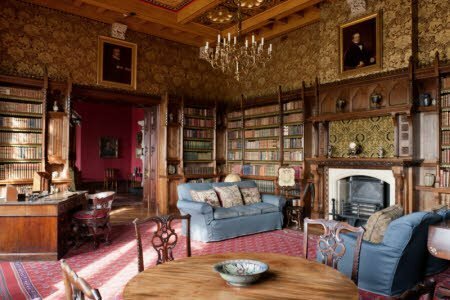 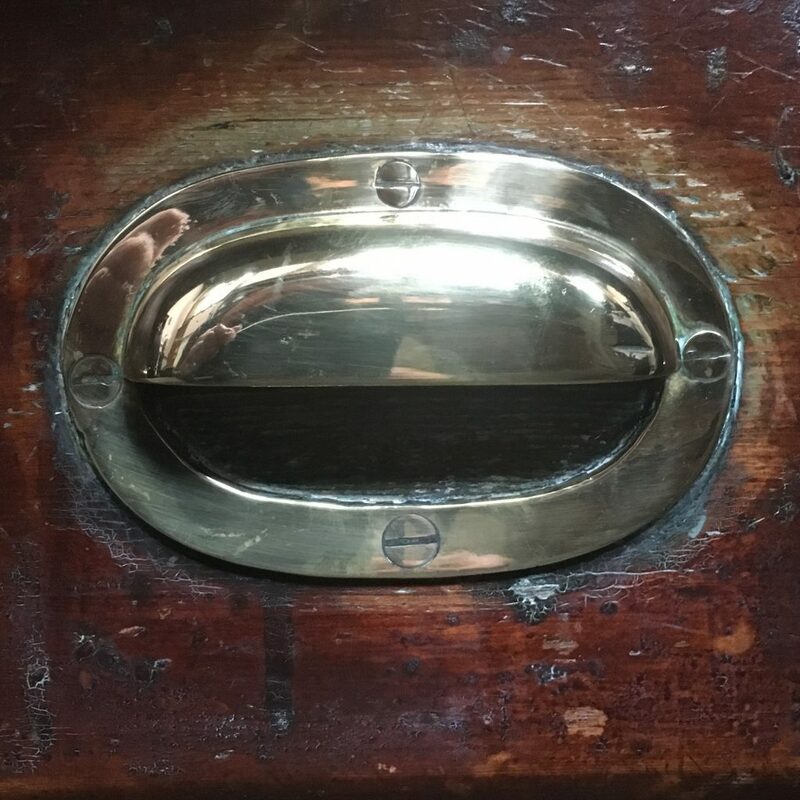 All the domestic tasks and staff to run the house were hidden behind the green baize door, the single item of joinery that marked the divide between master and servant. 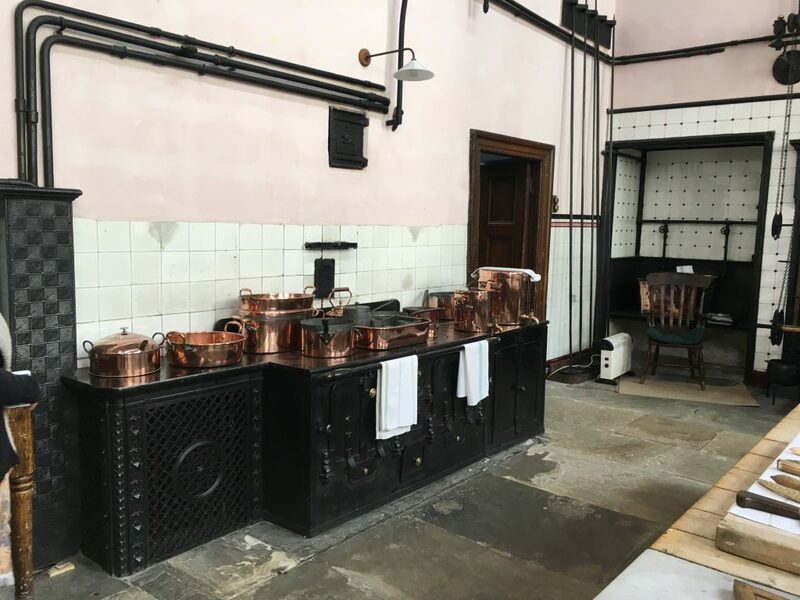 Such extravagance on staff is rare these days; we tend to cook for ourselves, use machines to wash our dishes and we generally tend to run our own lives. 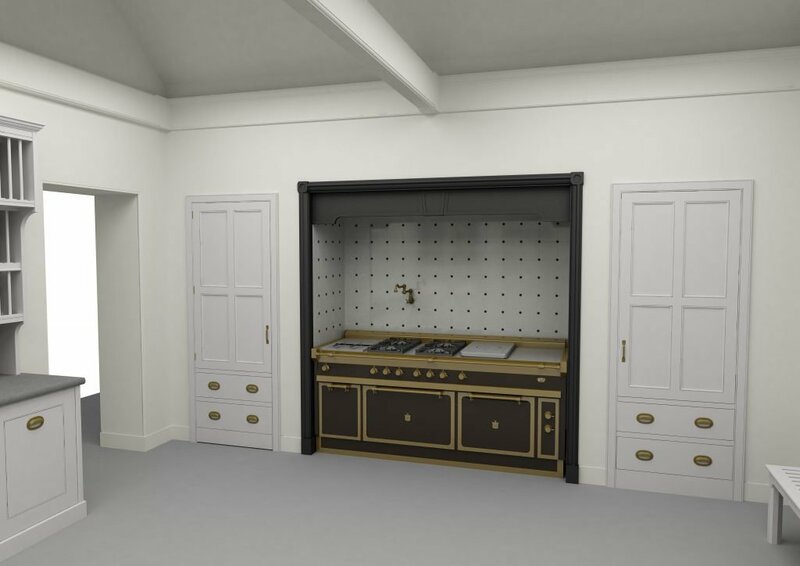 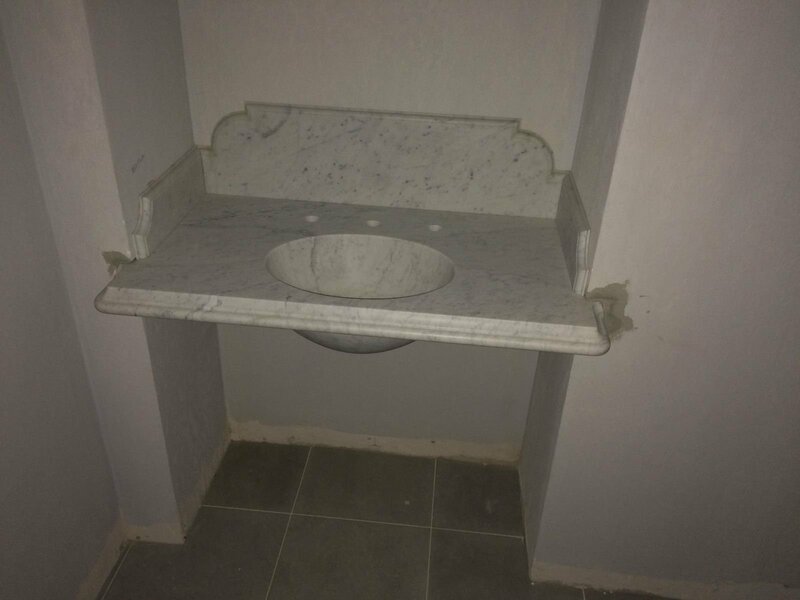 This can present issues when designing new bespoke kitchens for large country houses that were once run by numerous servants. 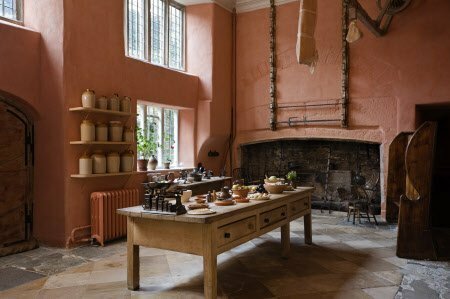 For a start, typically the kitchen would have originally been at the back end of the house, away from the reception rooms of the house. 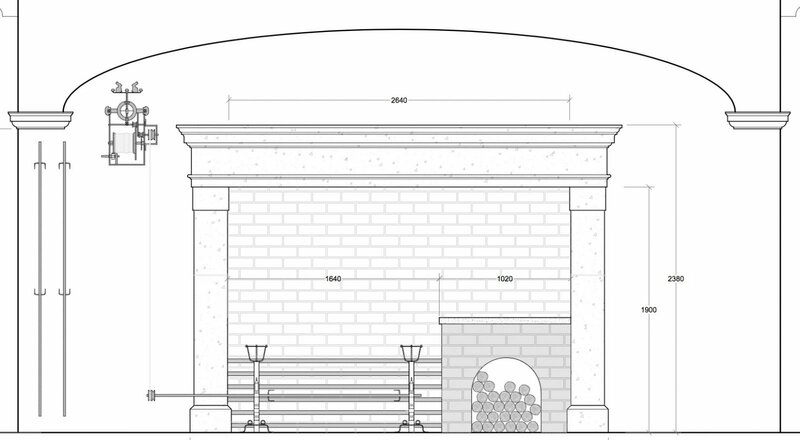 This would minimise the risk of fire spreading to the front-end of the house, and also reduce cooking smells. 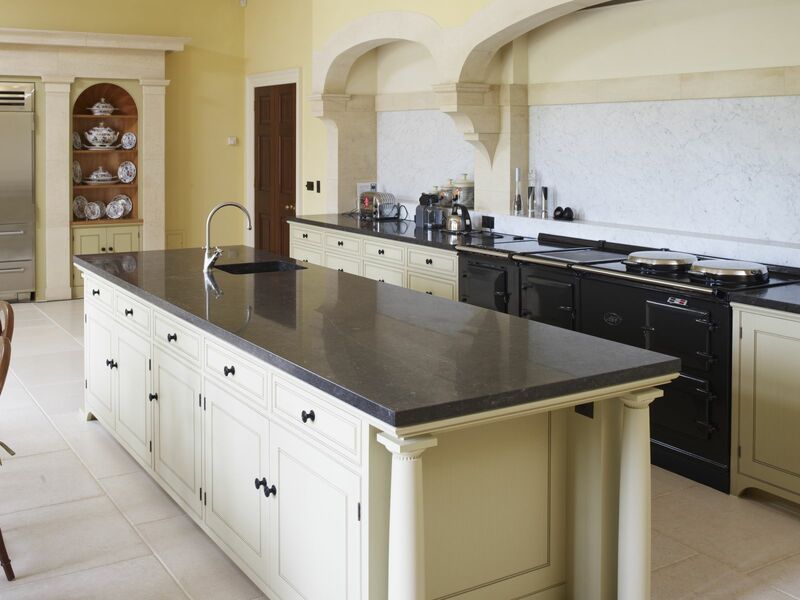 These days our clients often want their kitchens to be at the heart of their homes. 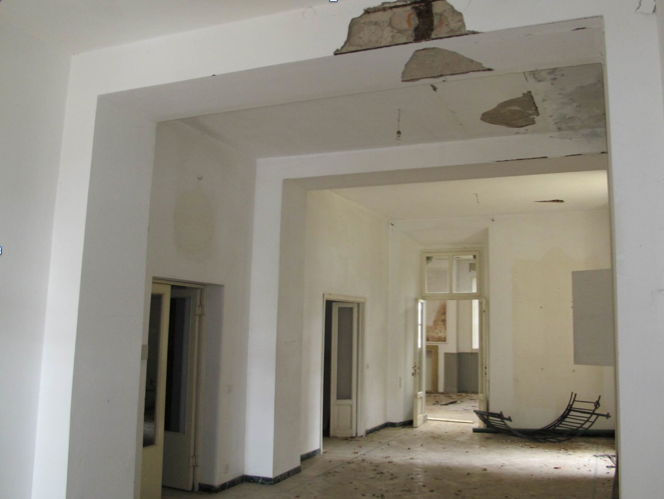 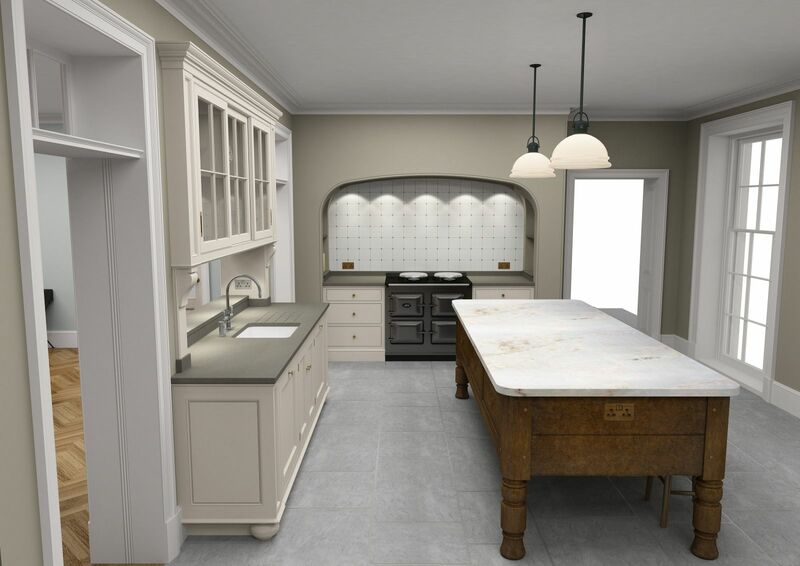 This results in us often having to design the kitchen into what would once have been a ballroom or a drawing room, presenting issues such as how to get services into the room, and how to get extraction out. 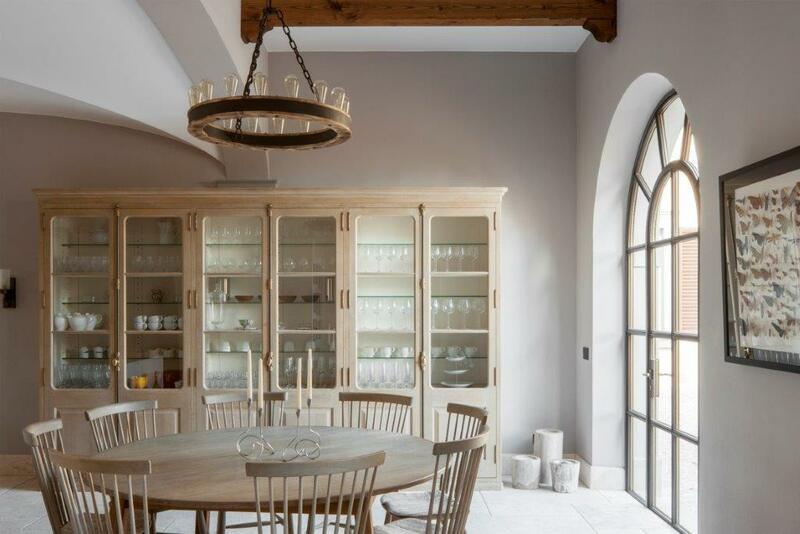 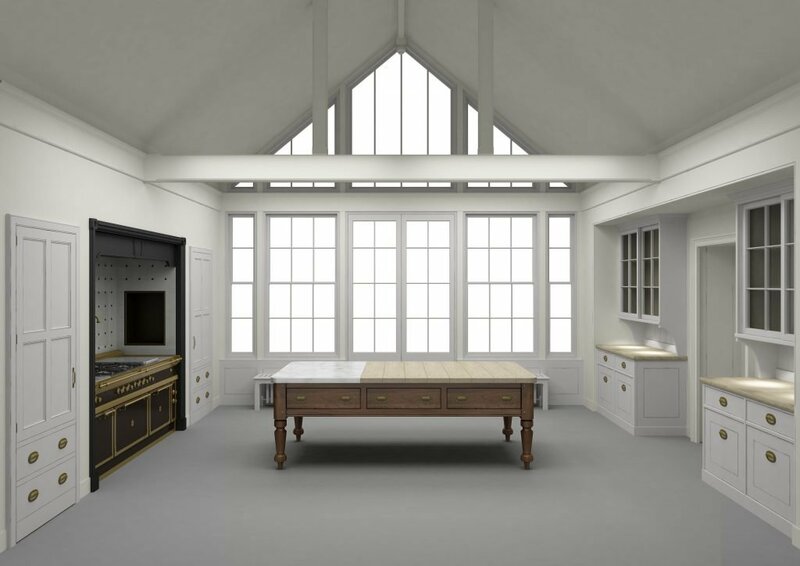 When Artichoke designs it’s bespoke kitchens, we will often refer back to the ways the domestic back ends of English country houses worked, and we often separate our kitchens into the same zones originally used in great country houses; Storage, Food Preparation, Cooking, Butler’s Pantry and Scullery. 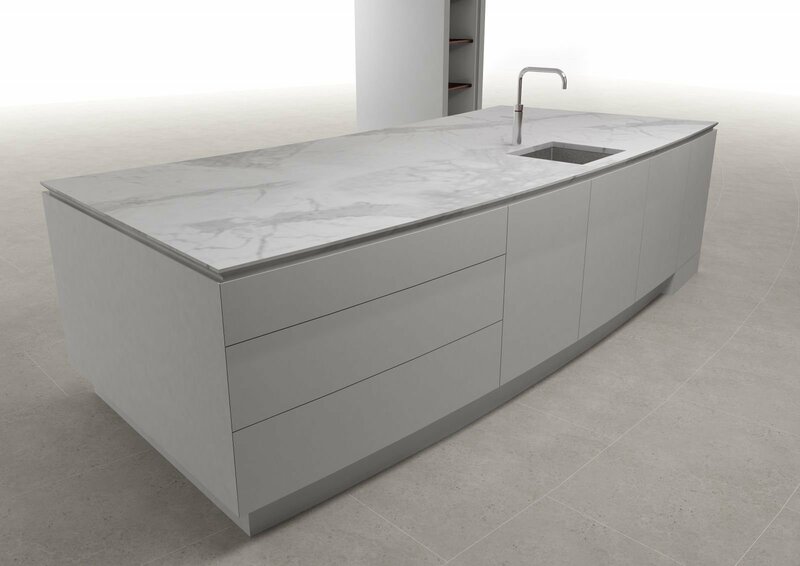 We are not advocates of the kitchen triangle which presents far too much rigidity for bespoke kitchen design and does not represent how most of our clients live. 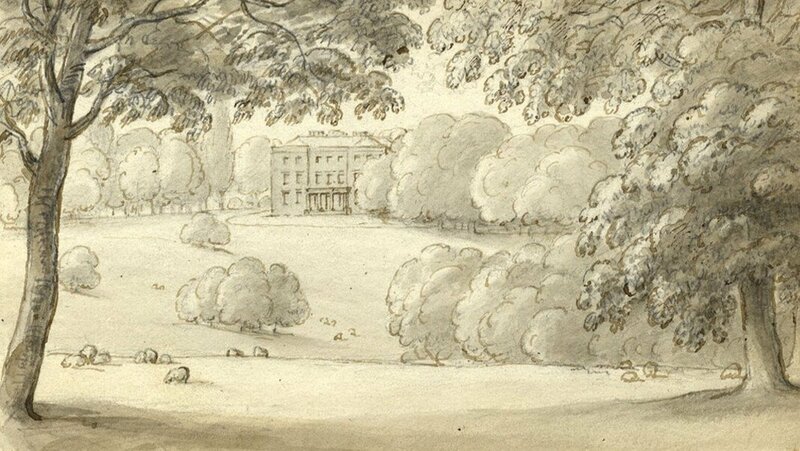 On large estates, the acquisition of food had to be a well planned affair, and having a level of self sufficiency was also an advantage (although it required an army of outdoor staff to grow fruit, vegetables, flowers and herbs). 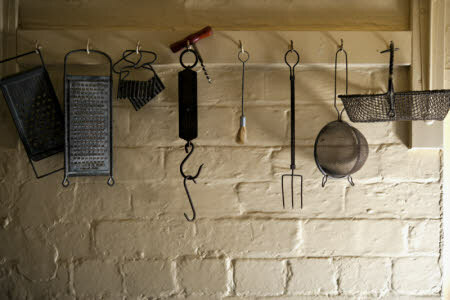 The meats were often the produce of sport, and caught or shot by the hands of the gentry and their friends. 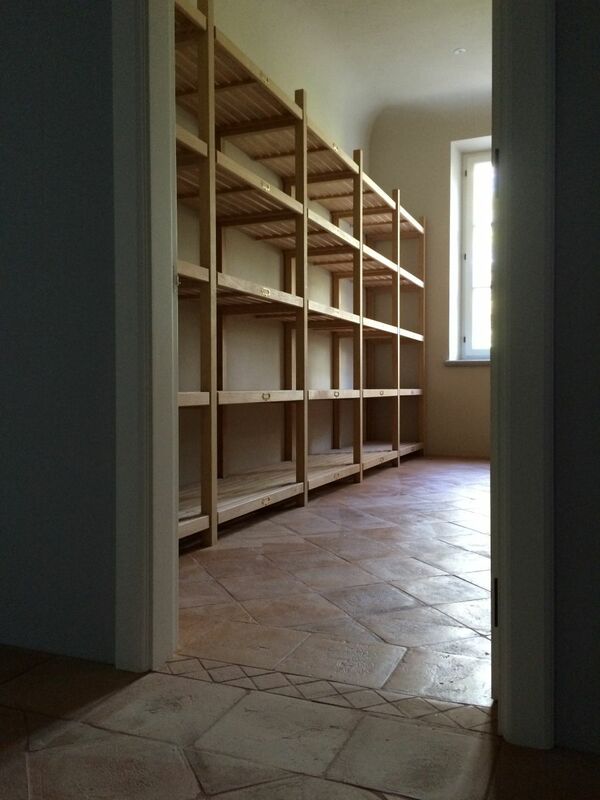 It was the housekeepers job to manage the storage of these goods. 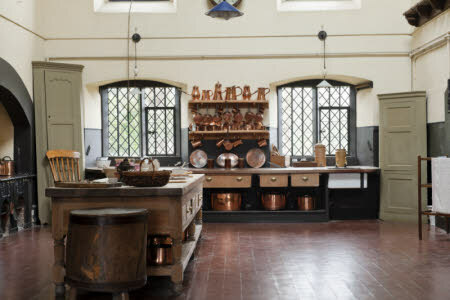 Advantage was taken of the abundance of food in the Summer, with any overage being preserved in the Still Room, a mini kitchen with two ranges on which jams, preserves, pickles, cakes and confectionery were made for afternoon teas. 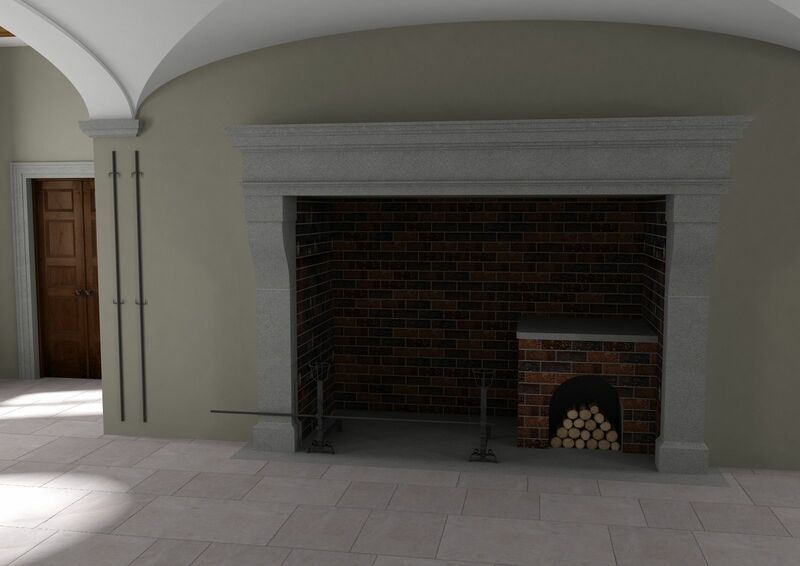 The game larder was usually positioned on a North-East facing position to minimise heat from the sun; in many houses the walls were often hexagonal in shape to maximise wall surface to the cold air outside. 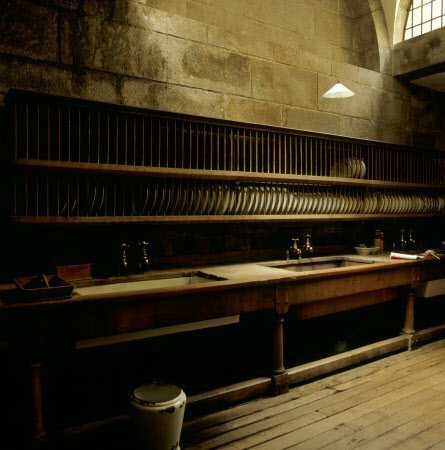 The roof often had special ventilation to minimise smells from the hanging meat, and screens on the windows keep the vermin away. 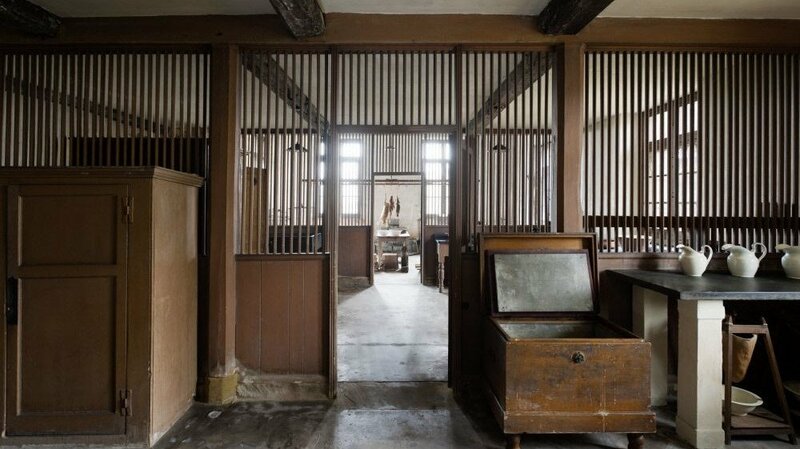 Lead lined tanks around the room would be used for meat to be wet or dry salted, allowing the game to be stored for several months. 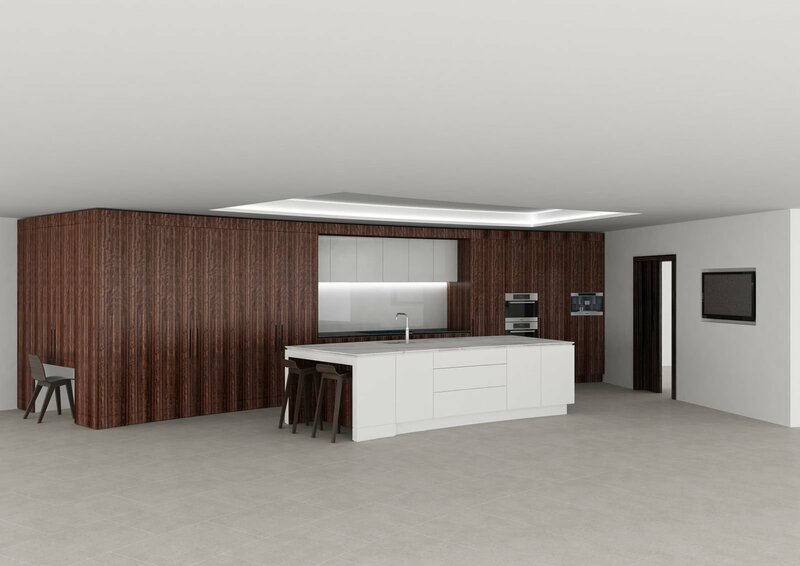 Of course, storage of food is significantly less laborious these days, with sophisticated appliances such as Sub Zero fridges with dual compressors taking the place of air cooled storage. 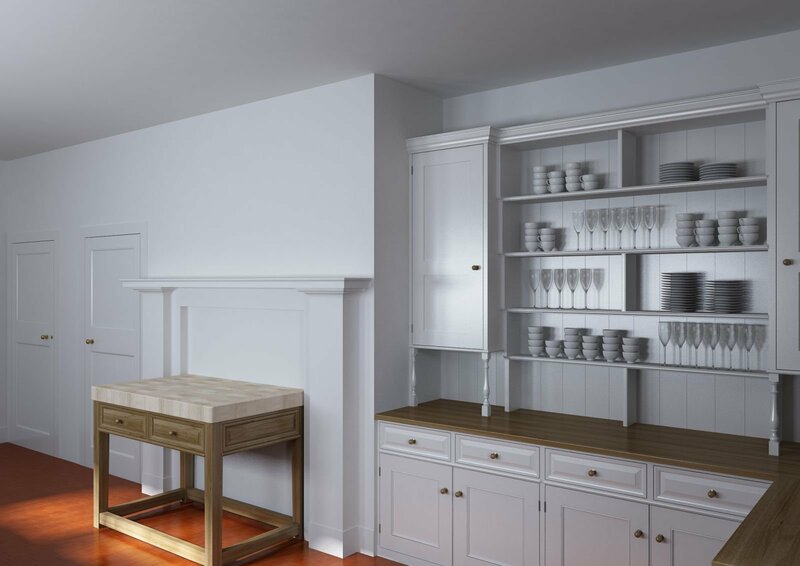 At Artichoke, we will often dedicate a separate zone in the kitchen to dry larder storage, often referred to as the Pantry. 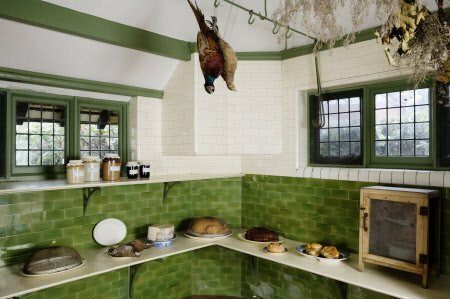 The pantry above was designed into a Queen Anne house in Gloucestershire by Artichoke. 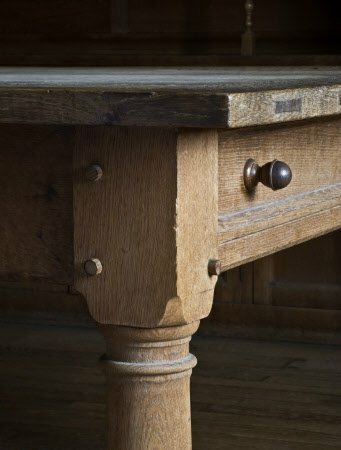 We will often employ simple “estate joinery” techniques for secondary spaces like this. 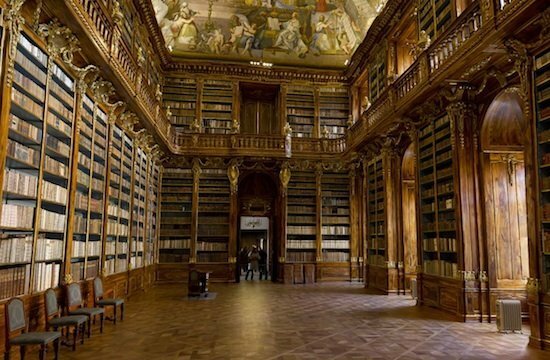 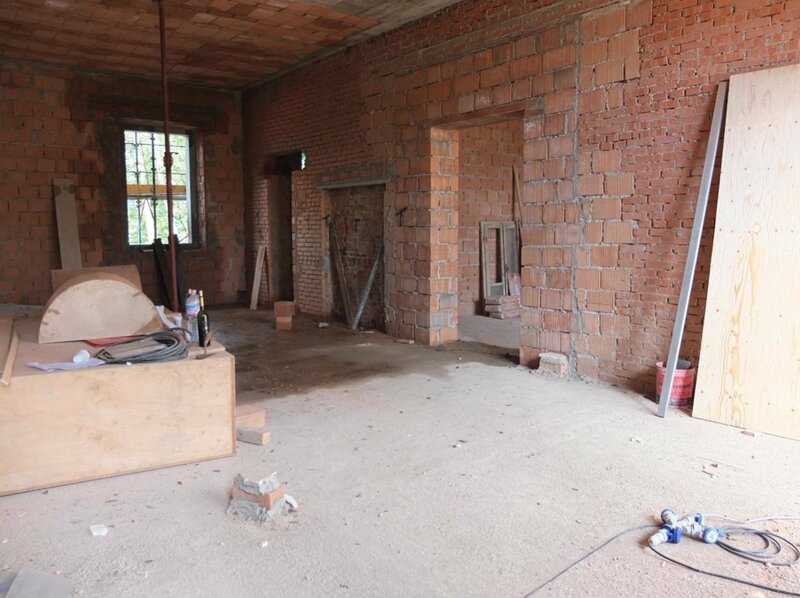 Click here to see more information on this project. 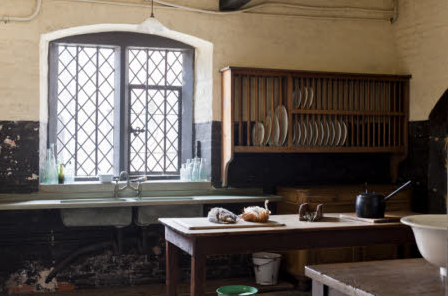 The early domestic kitchen would have been an animated and noisy hub of the domestic back end of the house. 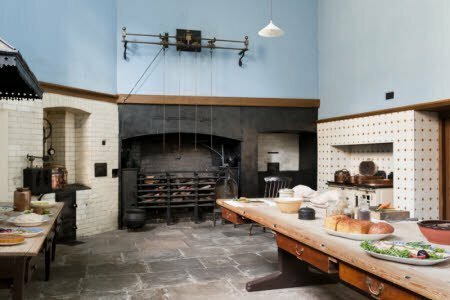 The modern kitchen is often similar, albeit with less staff and more gadgets (and often more children!). 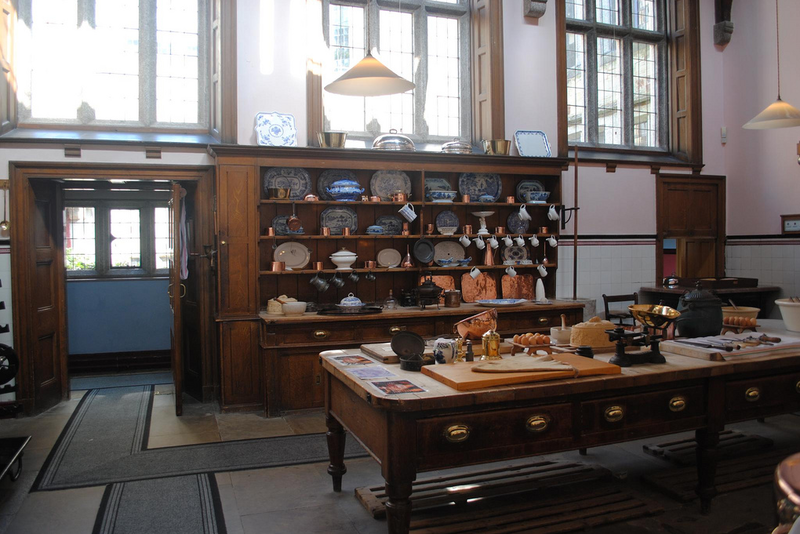 In large English country houses, the large kitchen table would have been the focal point and main preparation zone. 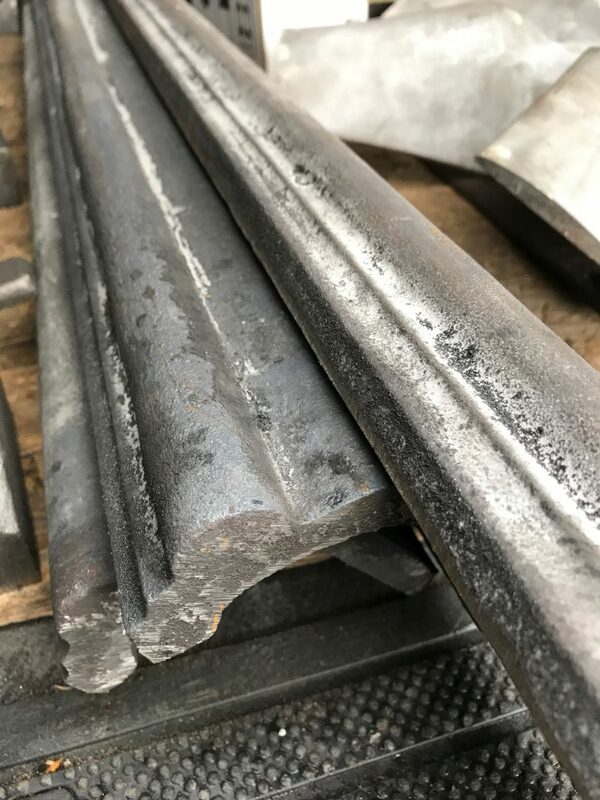 Many of the functions carried out then were the same as today; grinding chopping, mixing, beating, mincing and rolling were all undertaken by staff. 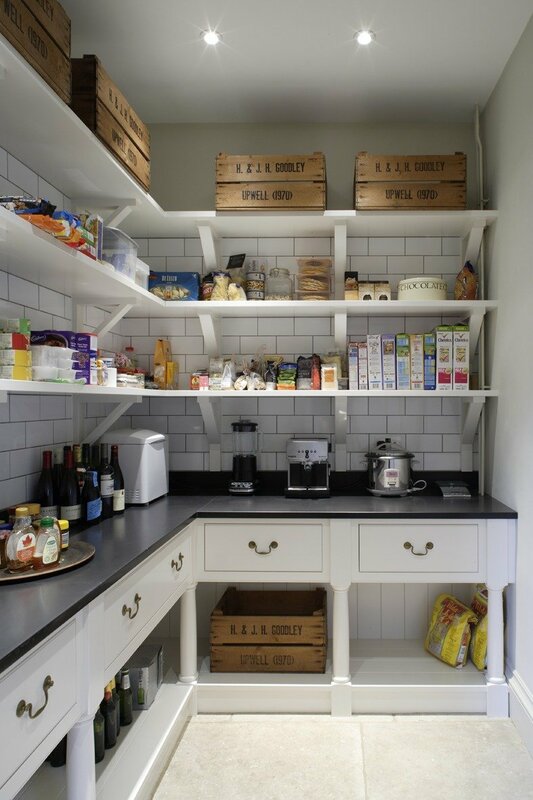 These days we use islands to prepare food on and often buy in ingredients ready minced and prepared. 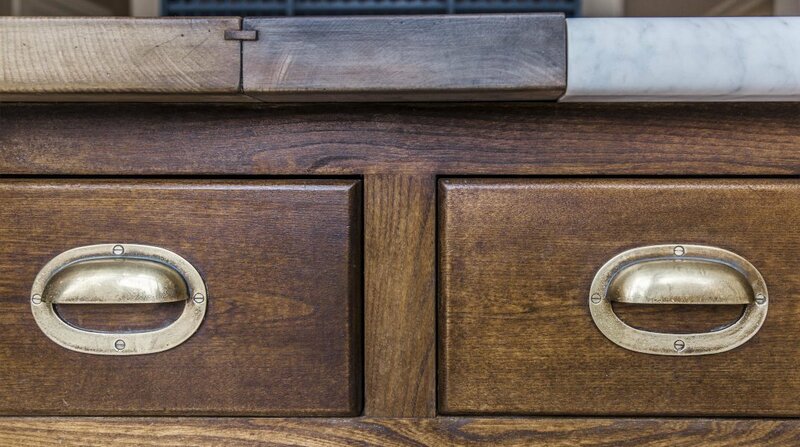 We also have gadgets to do the chopping and grinding for us and we also tend to entertain far less formally than we used to. 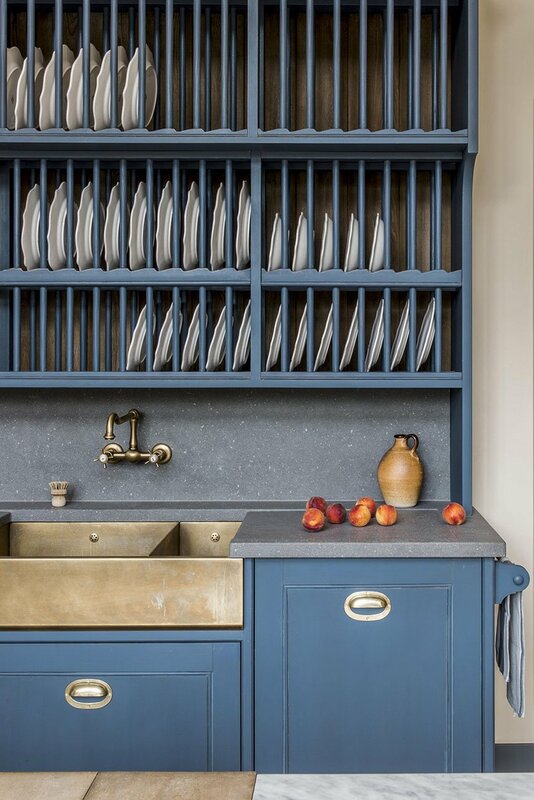 Despite the differences in equipment, the cooking process starts when raw materials are deposited at the scullery door (the Sub Zero fridge being today’s equivalent). 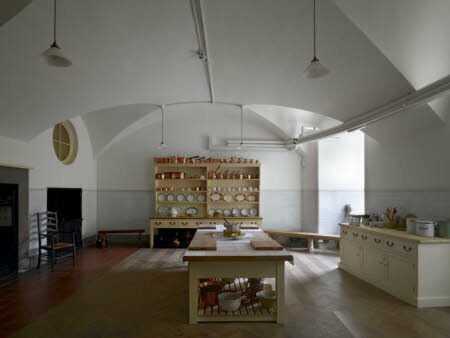 Regardless whether there are servants or not, food is still cleaned, stored, prepared and presented to guests. 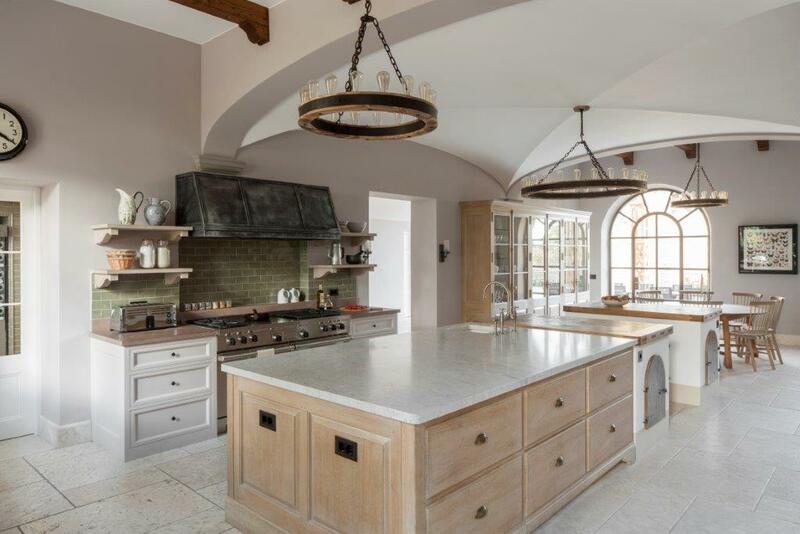 A large central preparation island sits at the help if this Artichoke kitchen. 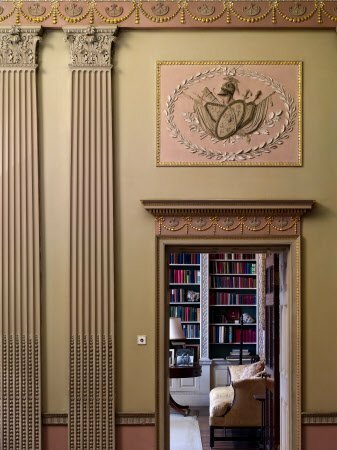 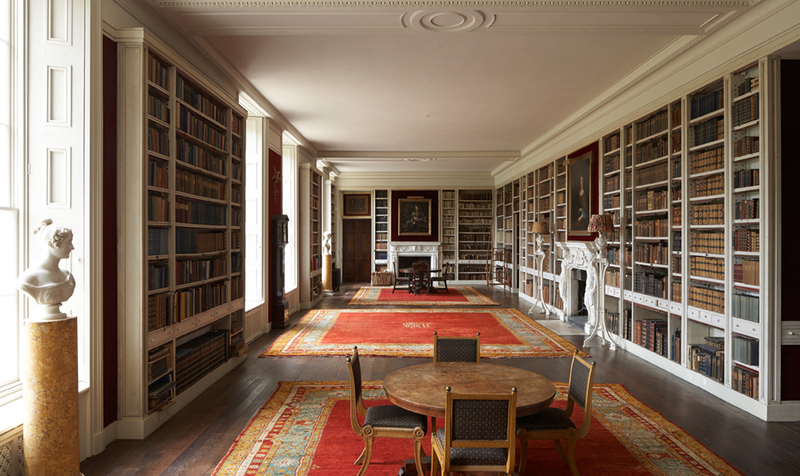 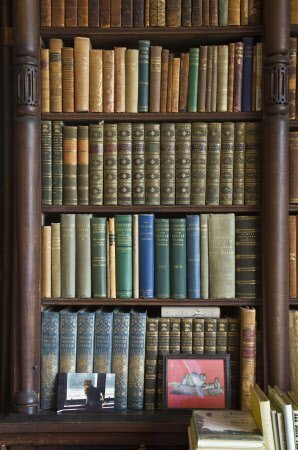 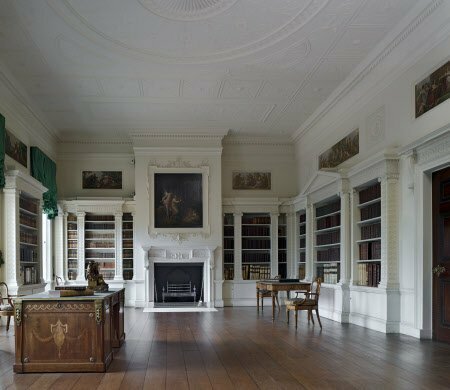 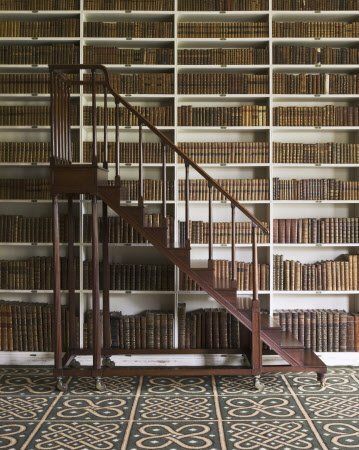 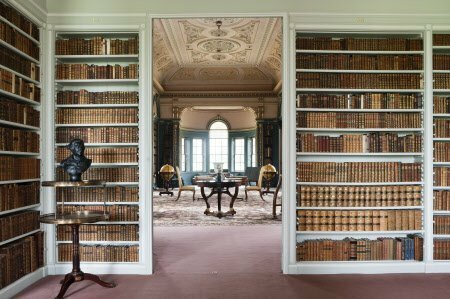 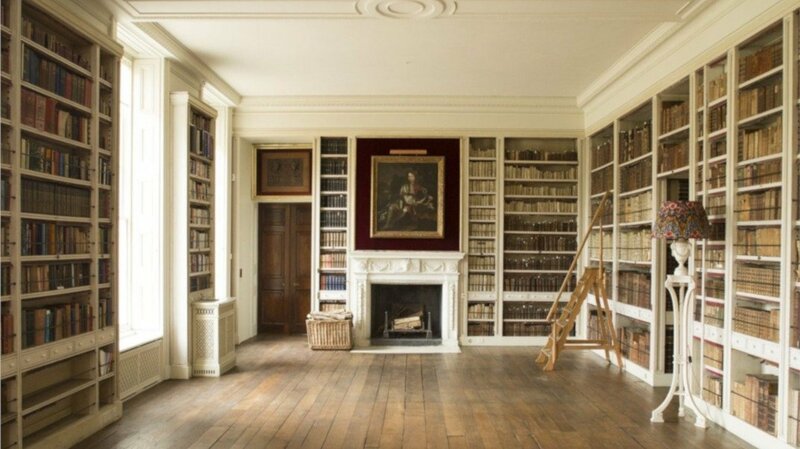 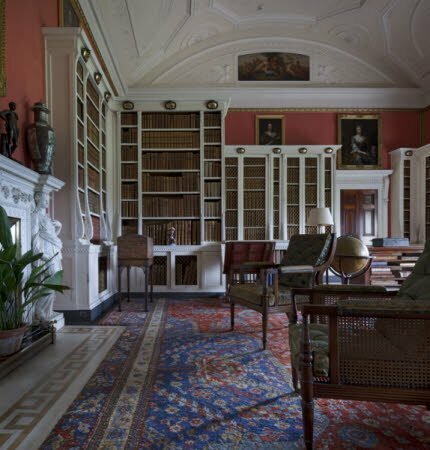 The furniture was detailed with classical Doric Greek mouldings, designed as a scaled copy of the facade of the new addition to this John Soane country house. 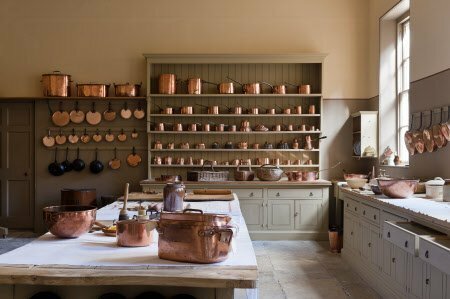 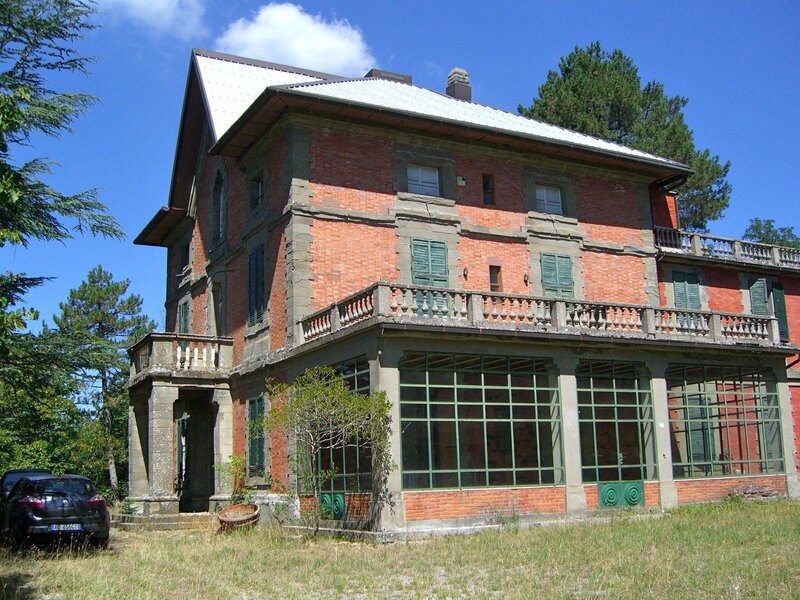 Large country houses had a plethora of cooking options available to them. 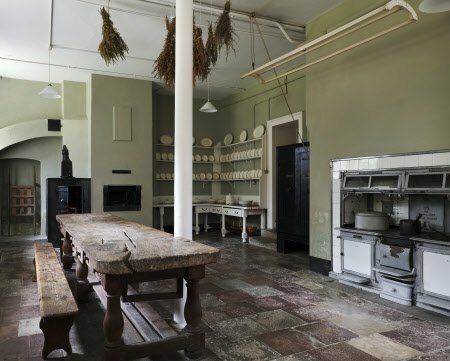 In the 19th Century, roasting meats on an open fire was the preferred method of cooking. 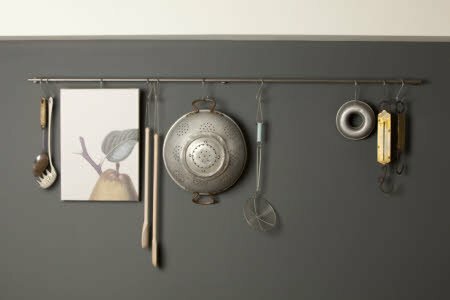 Meat was secured on skewers that rotated slowly in-front of the fire with the juices being collected in the tray below (in which they later made Yorkshire pudding). 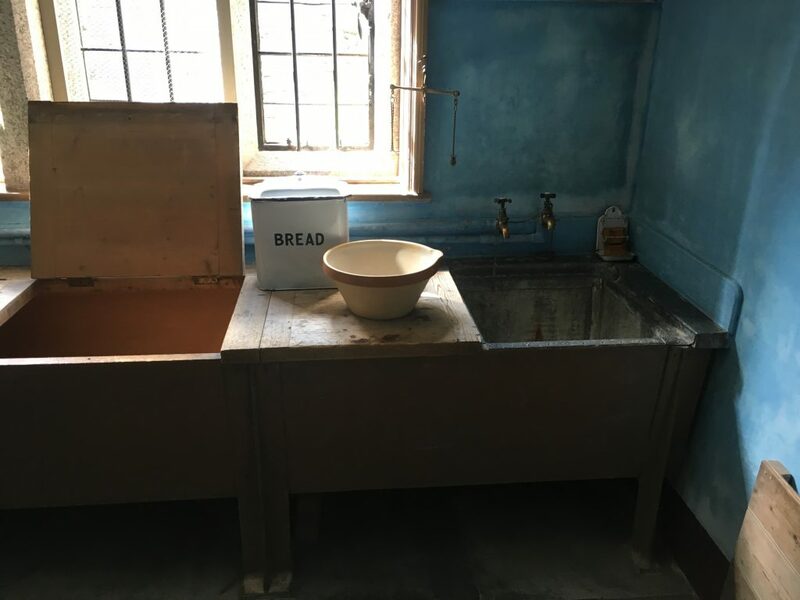 There was also usually a large boiler where puddings were boiled, a warming oven to keep meals hot, a stove for stockpots and a smaller hotter oven for pastry cooking. 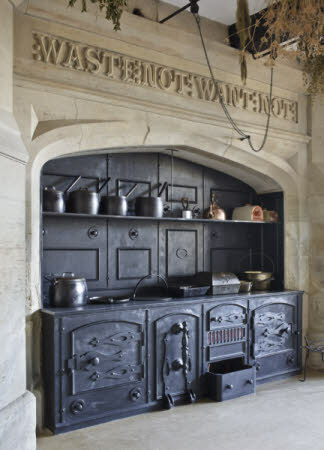 There was also often a charcoal stove, used as a type of indoor barbeque, a task adequately replaced by the Grill (such as the one found on the Wolf Dual Fuel range below). 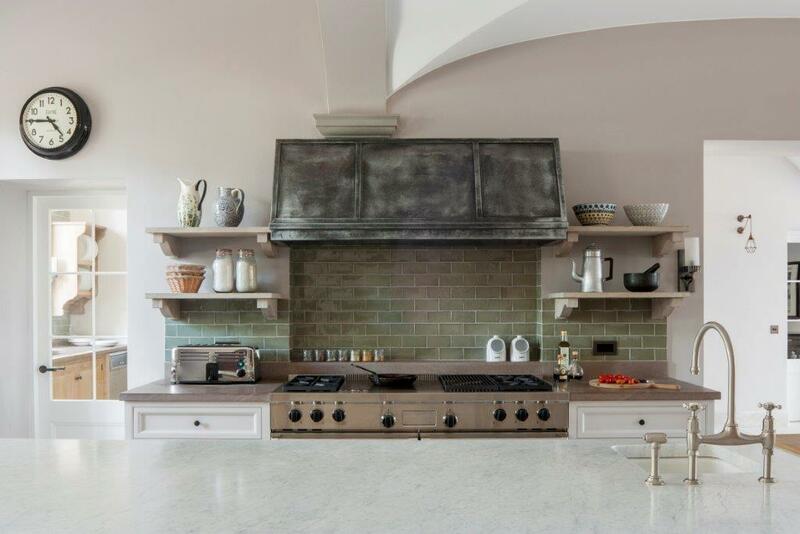 As a nod to the kitchens of the past, Artichoke has recently designed a large open fireplace with a spit into the kitchen of a large country estate house in Tuscany. 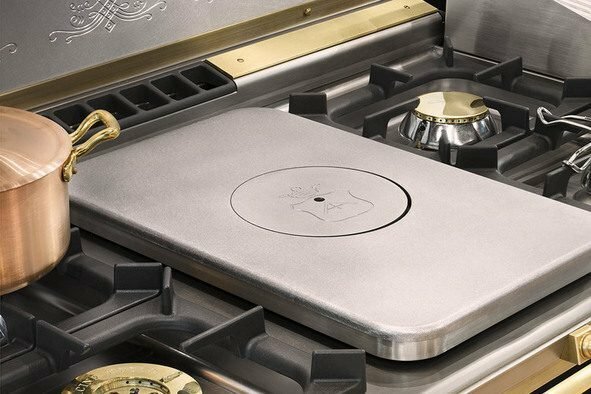 Cooking meats on an open fire is a fantastic method of cooking if you have the available equipment. 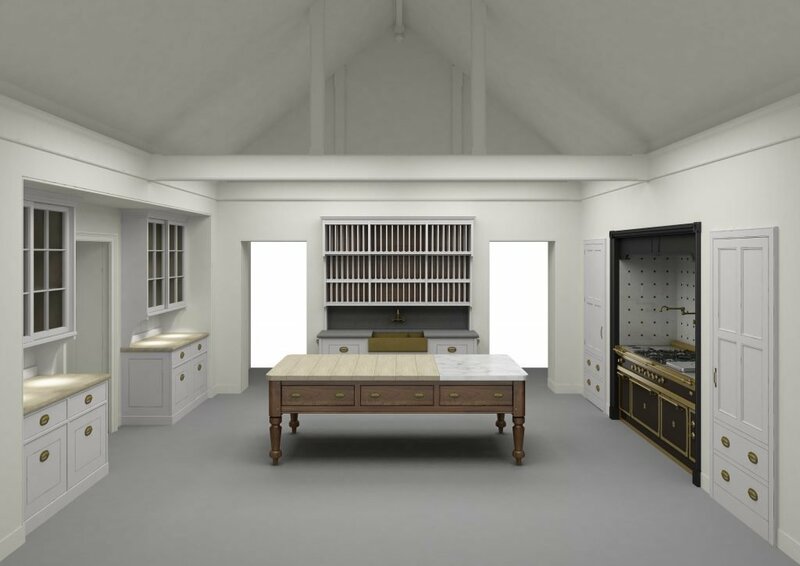 The Butler’s Pantry came into fashion in the English country house in the mid to late 1800’s. 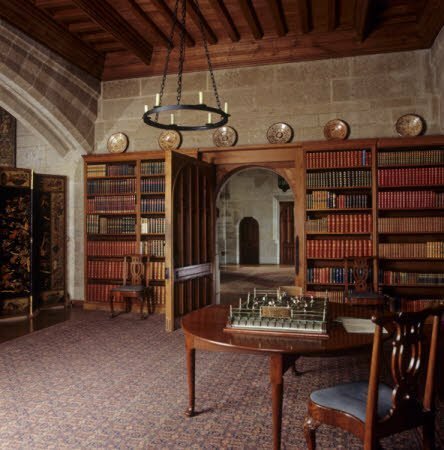 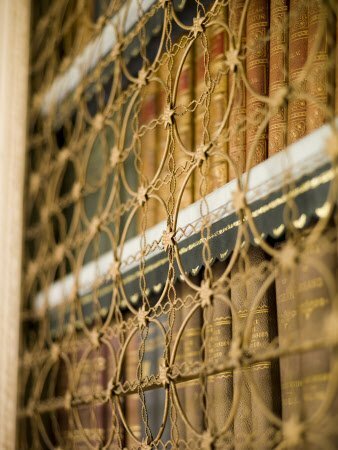 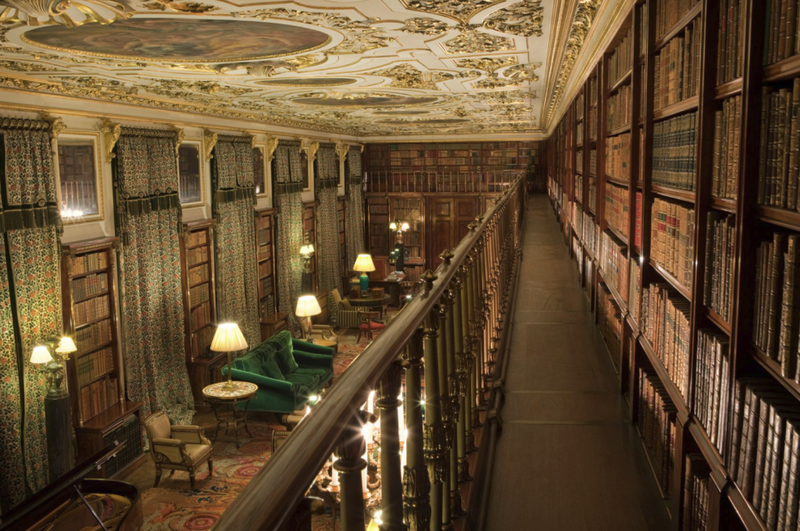 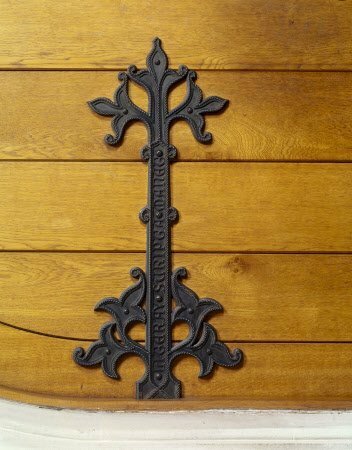 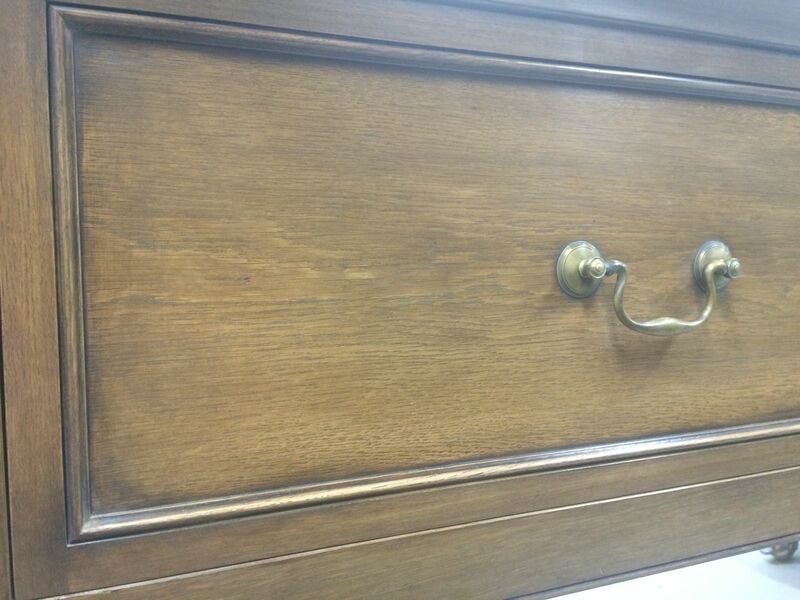 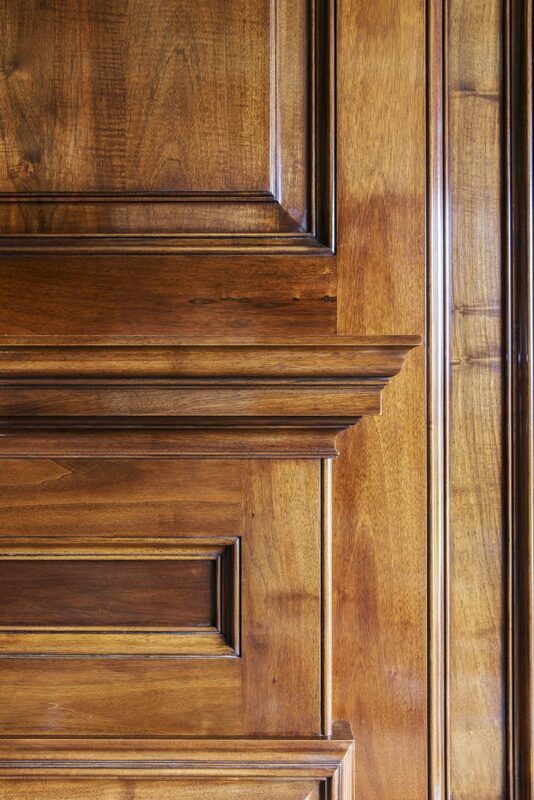 They because a staple of great English houses and were typically situated between the dining room and the kitchen. 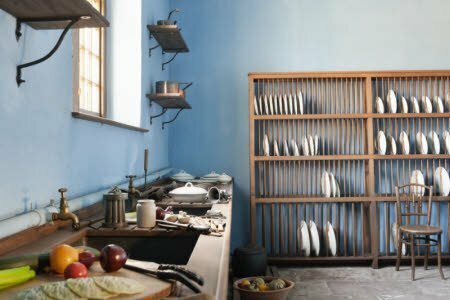 They were used for storing china and crockery and for serving and plating up food. 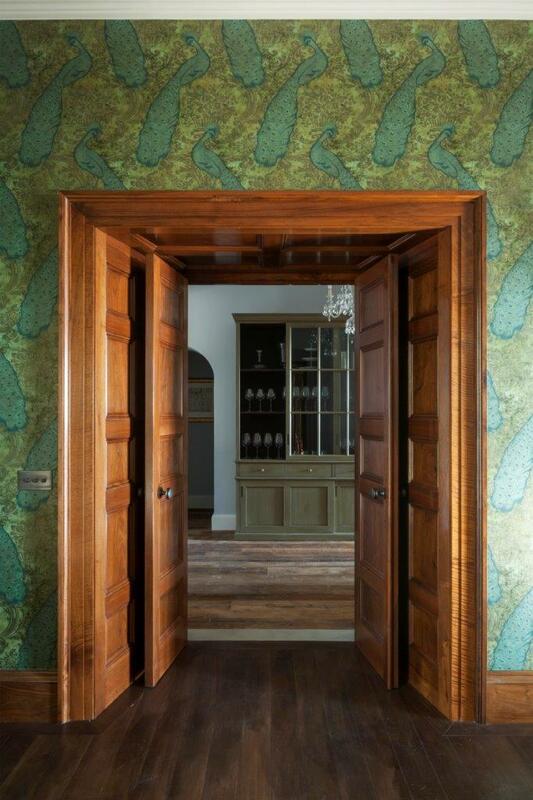 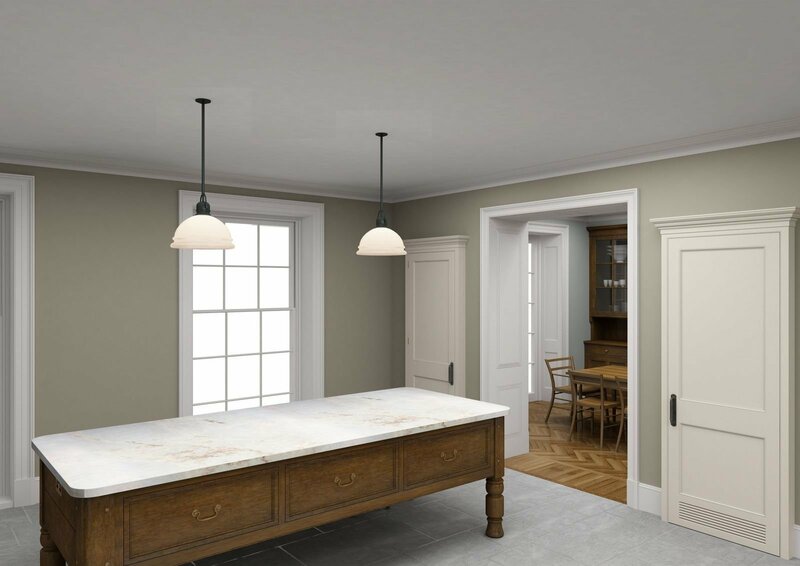 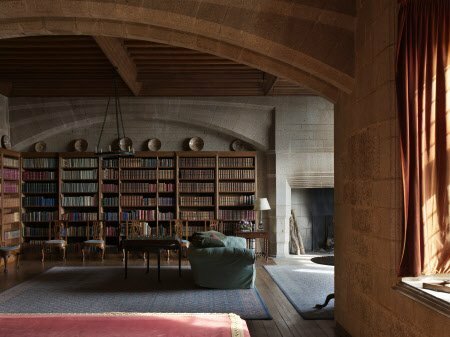 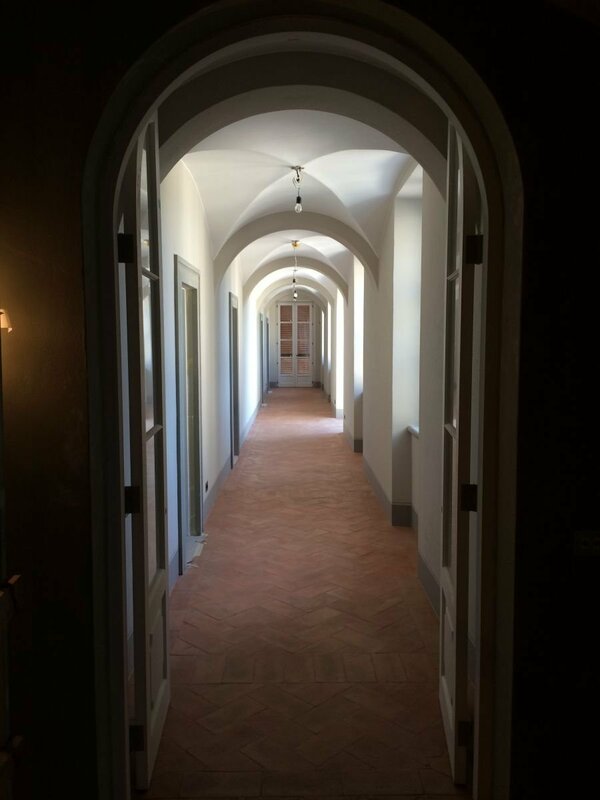 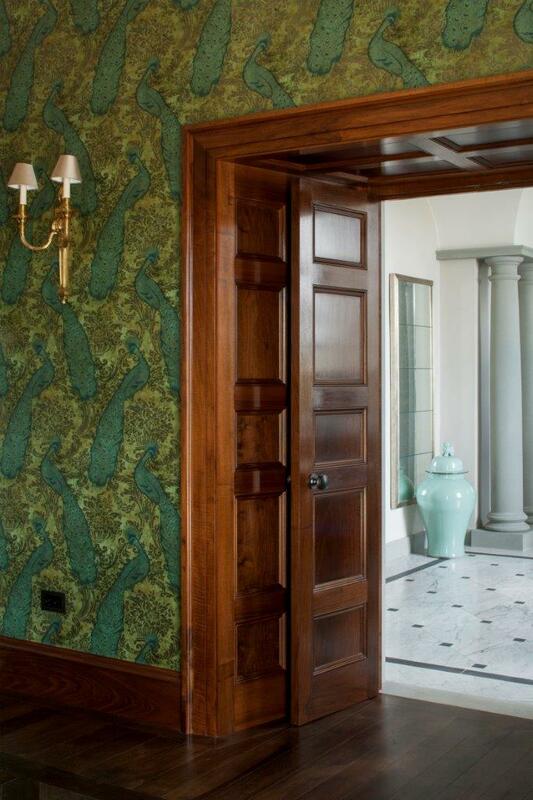 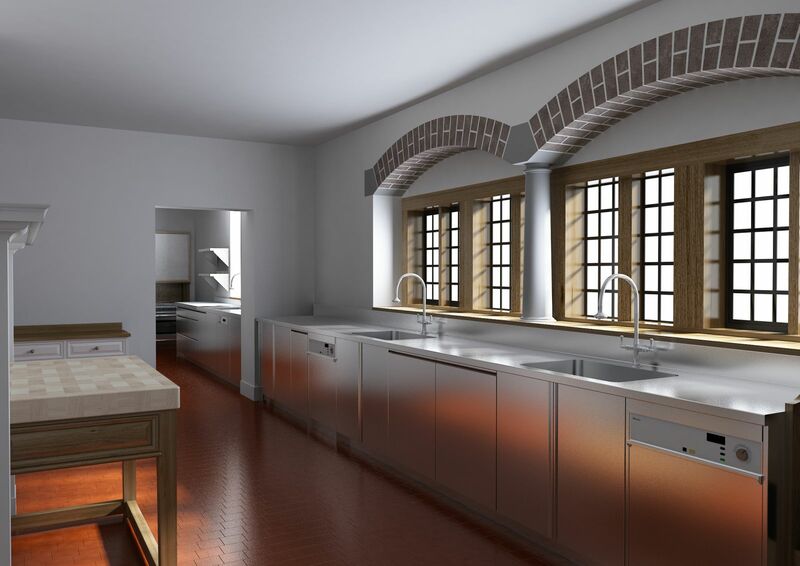 The example below, designed by Artichoke for a country house, shows both sides of the room, a short passageway between the kitchen and the main dining room. 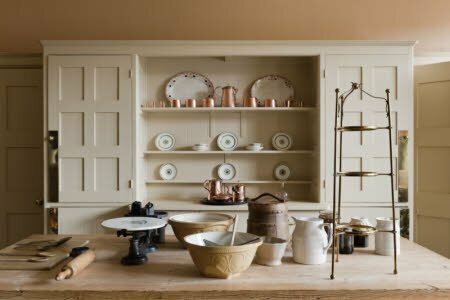 The scullery that supported large country estates was usually at the back of the house, often nearest the well or water source. 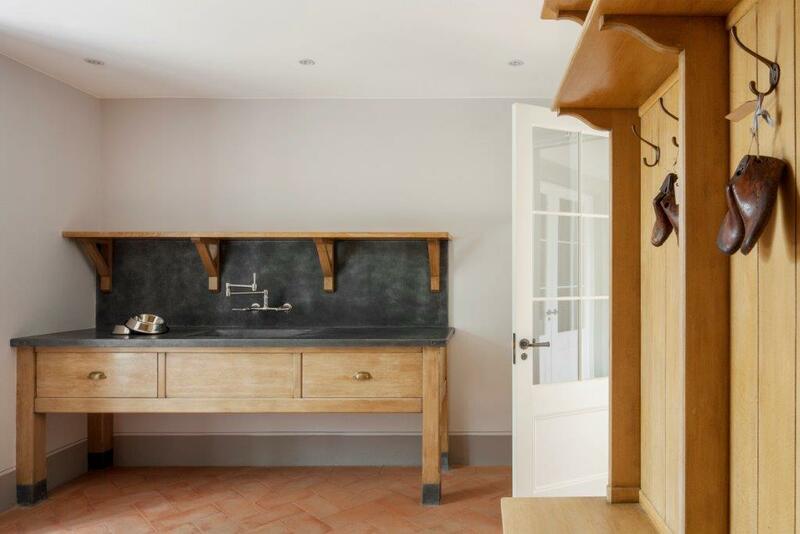 They would usually have stone floors and heavy drainage, and often the scullery floor was 150mm lower than the rooms adjacent to it to minimise risk of flooding to other rooms in the house. 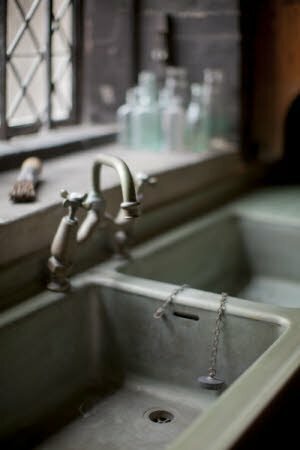 The scullery maid would usually stand on slatted mats to stop their feet getting too wet, and there were usually two sinks, one for hot water and one for cold. 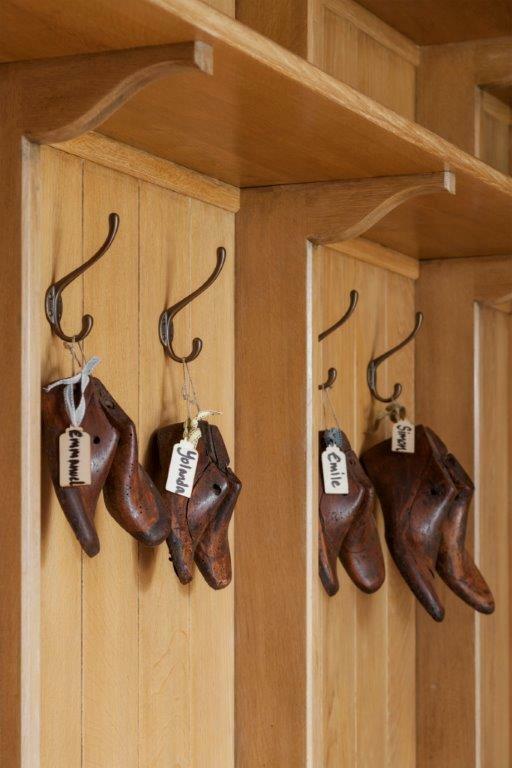 Sculleries were not simply for washing. 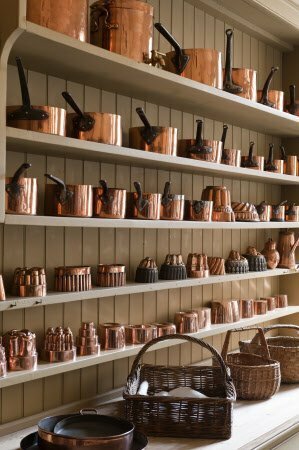 They were also used as early preparation zones, such as for cleaning mud off vegetables bought in off the estate or preparing game and fish. 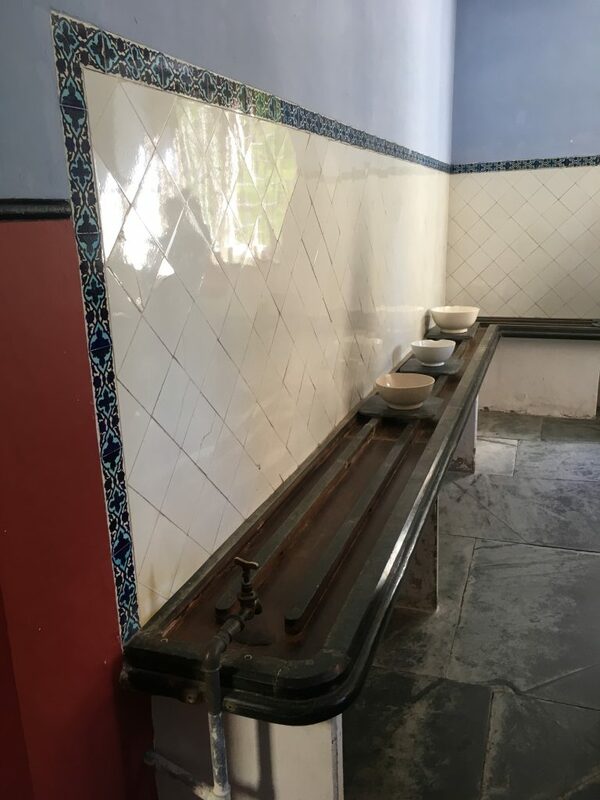 They were also used for laundry. 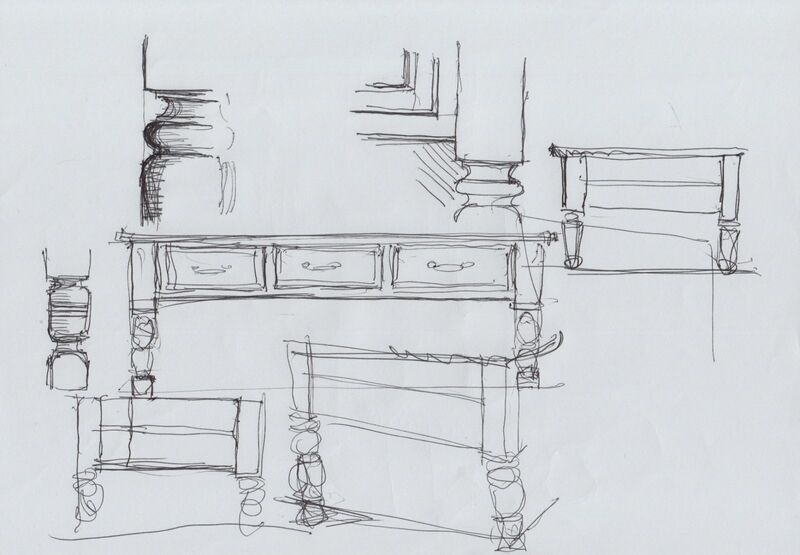 When designing the domestic ends of English country houses, the scullery and utility rooms will often be separate. 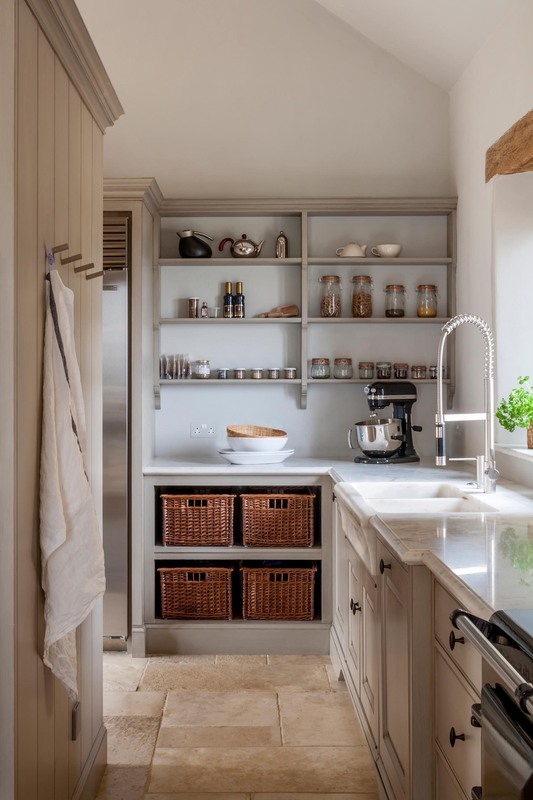 Artichoke’s sculleries will usually be for washing up plates and kitchen pots and pans, while utility rooms will be for linen washing and storage. 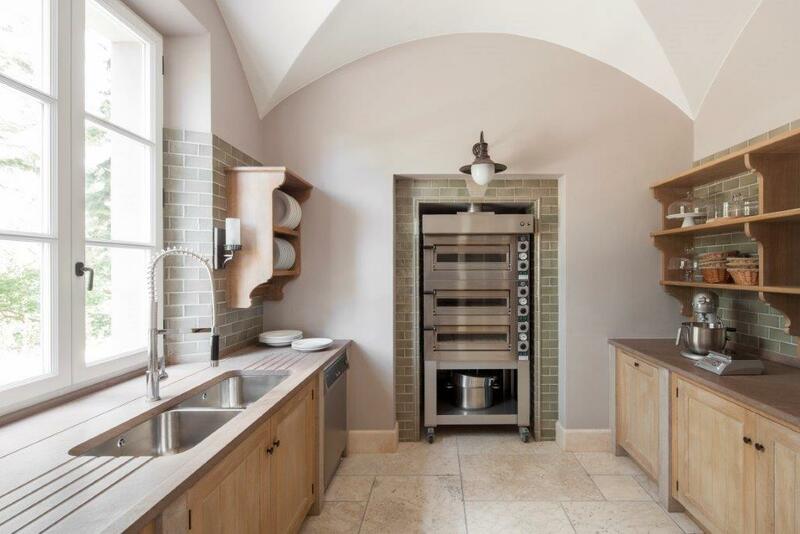 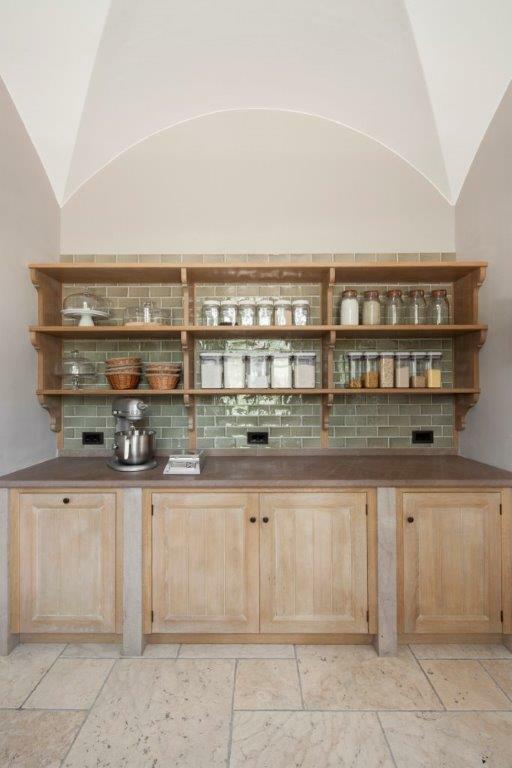 This scullery, designed by Artichoke for an Edwin Lutyens house, is used for butchery of game, washing up and crockery storage. 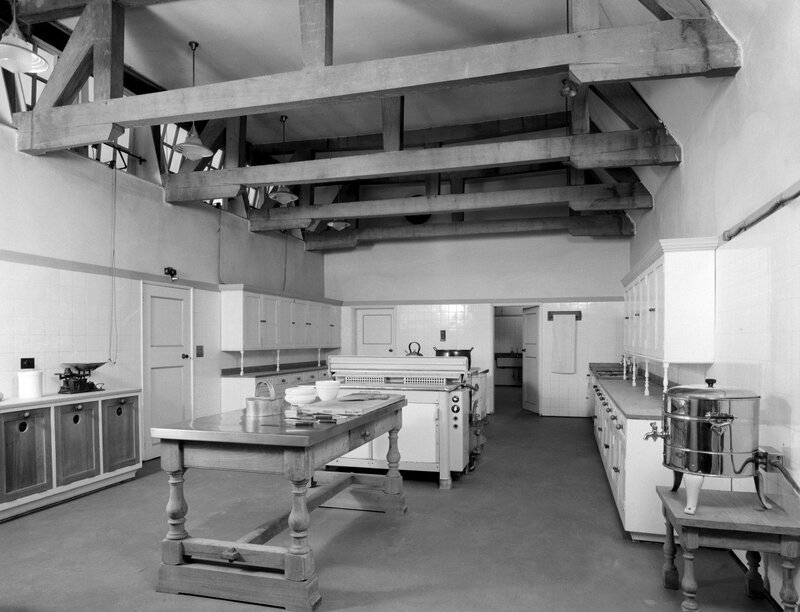 As the house is often used to entertain many guests, stainless steel was introduced to the washing up part of the scullery zone. 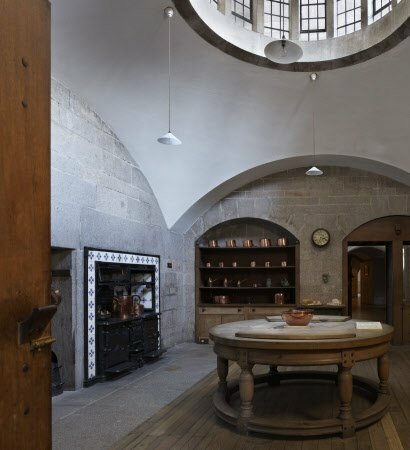 Round houses were once all the rage (think mud huts, yurts and teepees). 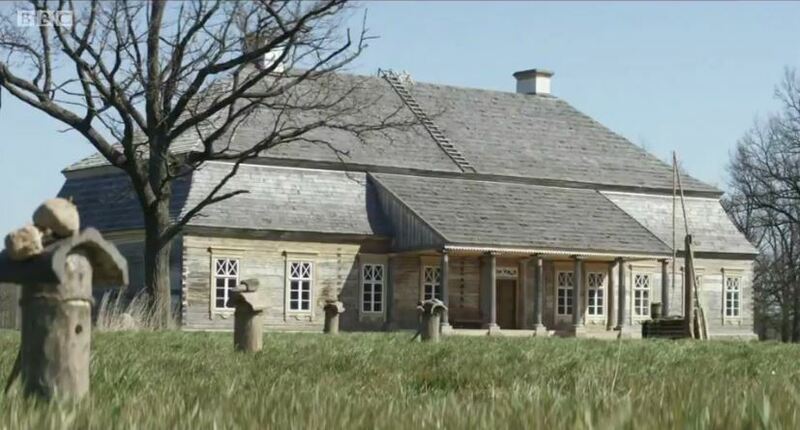 Houses were built in the round because they offered strength against earthquakes, strong winds and heavy snow, and because they were quick to heat and simple to roof. 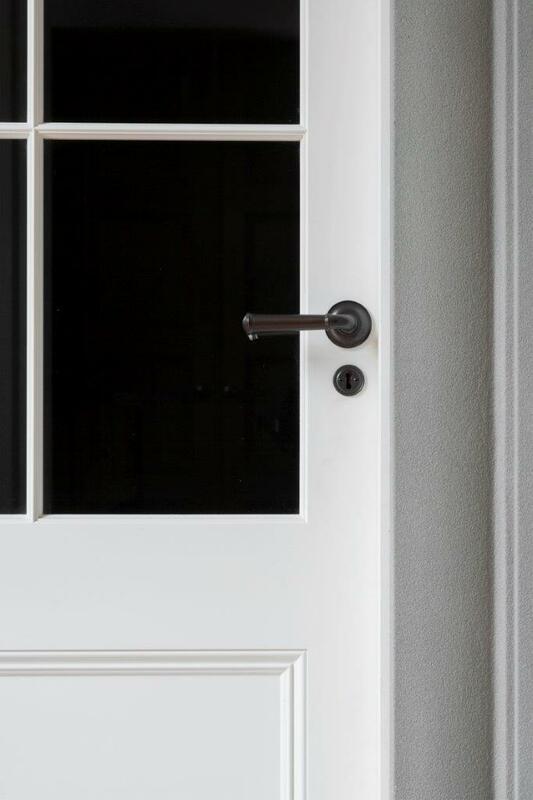 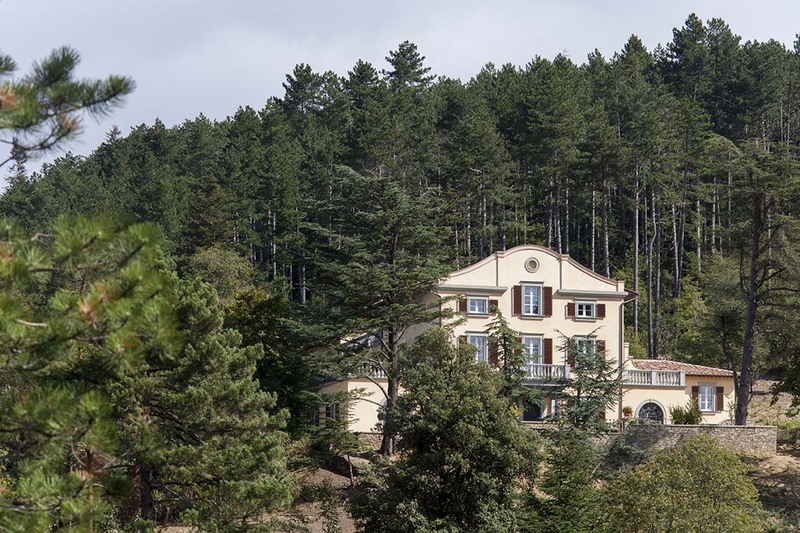 These days, modern building materials and fixings offer enough strength and stability to not have to deploy round exteriors for strength, and it is unusual to see one. 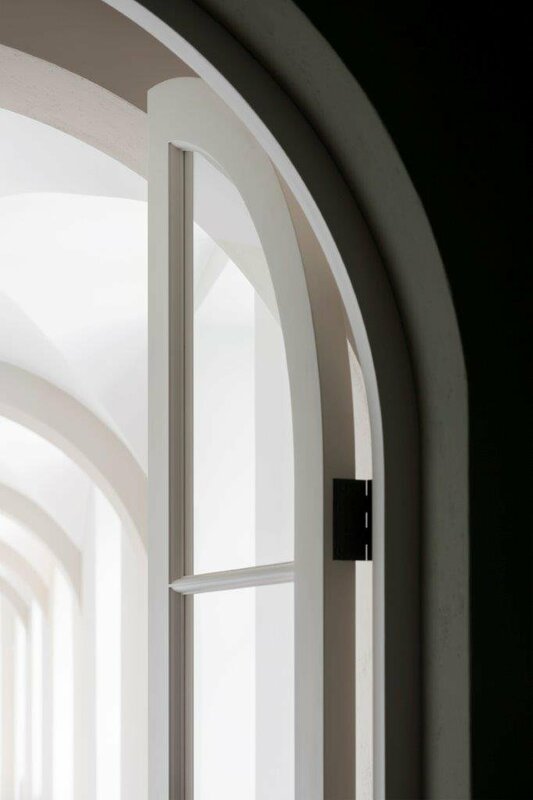 Not because the shape is unappealing aesthetically, but largely because the machinery that makes and shapes building materials such as steel, brick, glass, timber and stone is designed to produce it flat, square and straight. 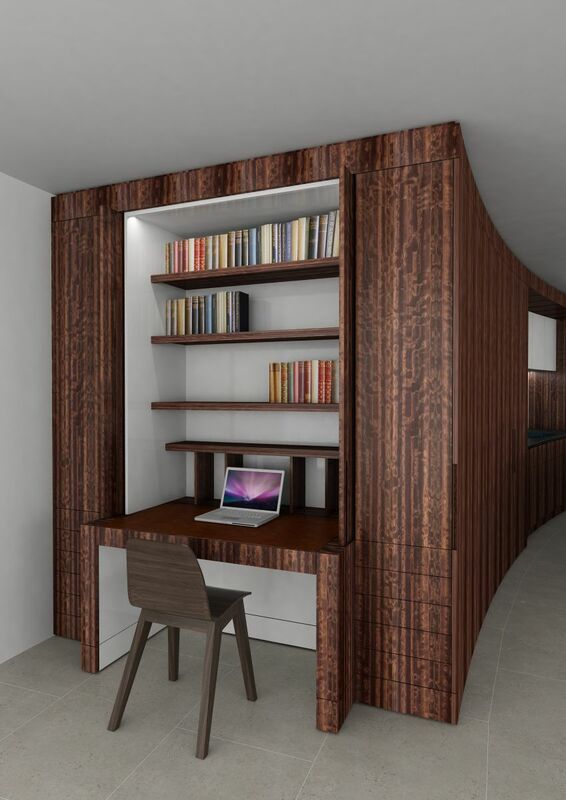 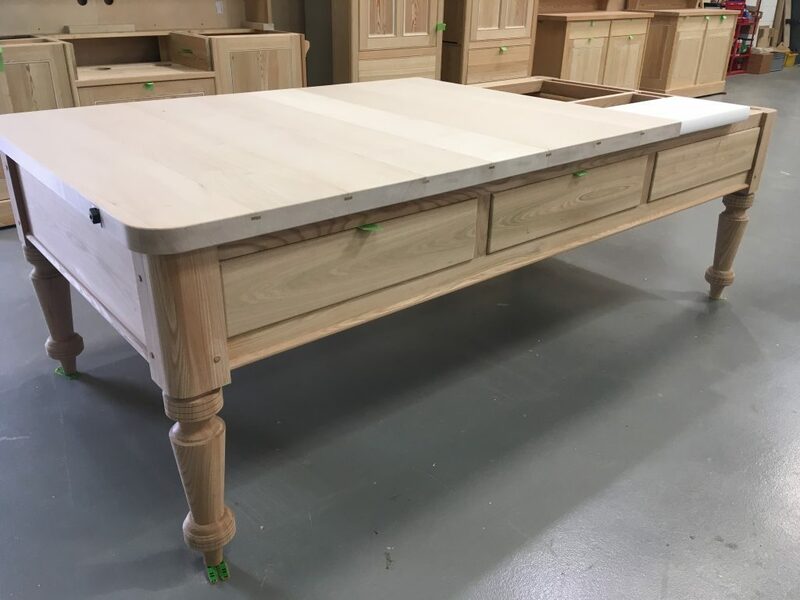 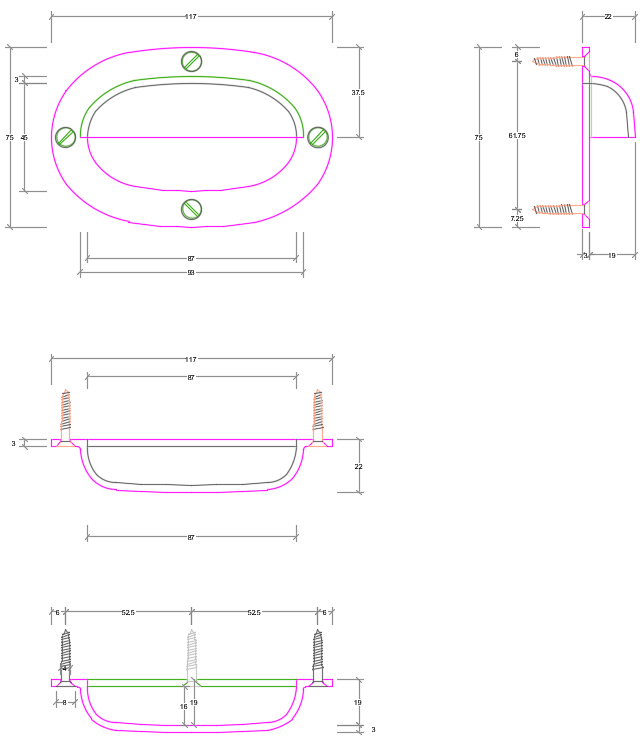 Flat, square and straight is the default setting for most building material manufacturers, so it should be of no great surprise that design and manufacture of curved furniture takes longer and ultimately costs more. 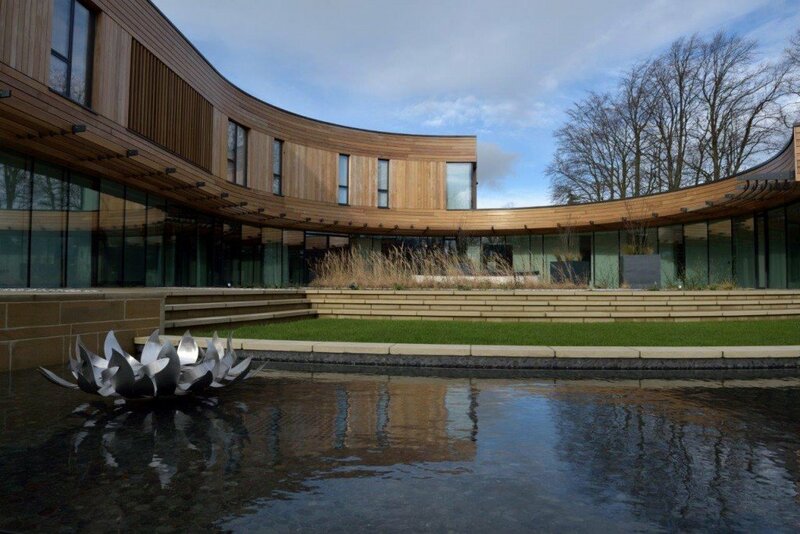 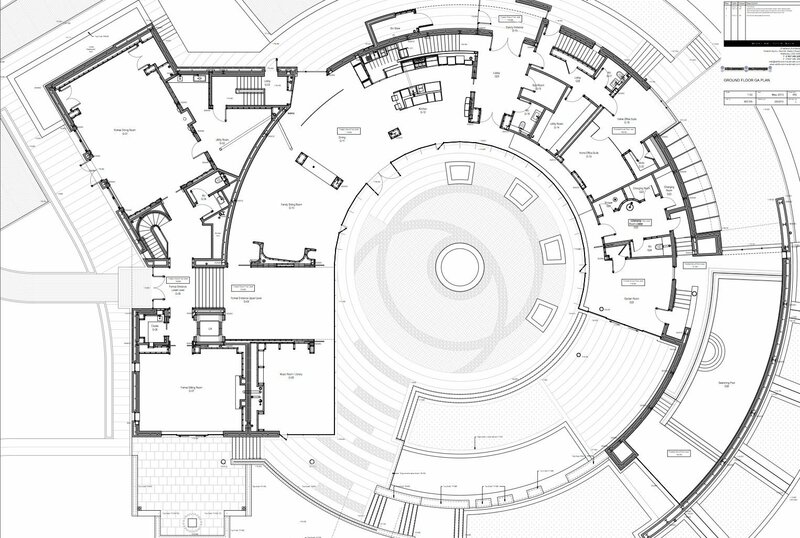 This particular house is round because it has been inspired by the circular garage carousel upon which it sits, created to store the clients car collection. 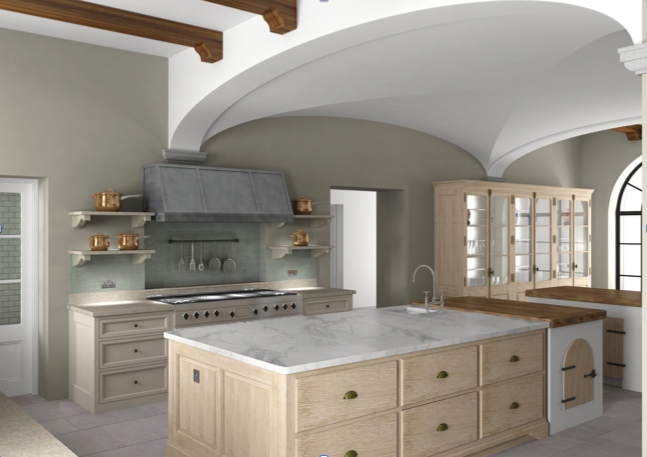 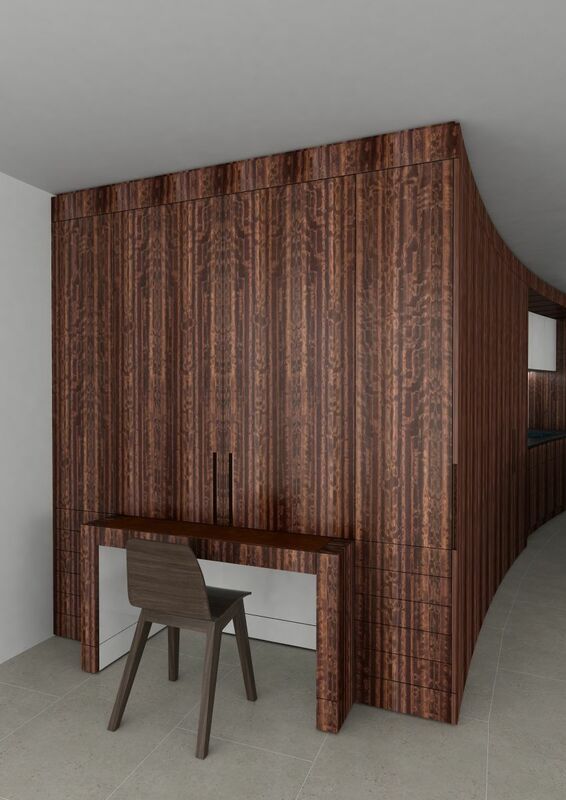 The project has been designed in collaboration with Mark Gillette and for it to be authentic and a design success, it was first vital that all of the curved elements of the bespoke kitchen doors were actually curved, and not faceted. 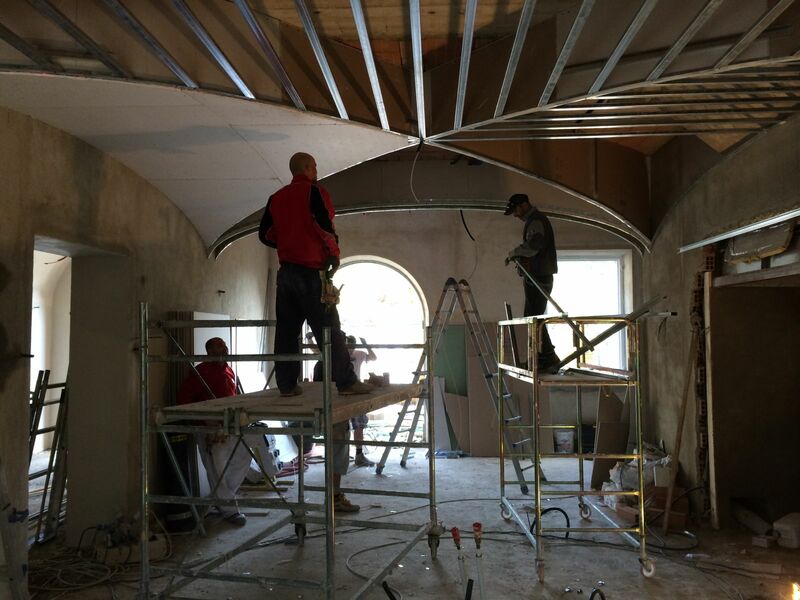 This challenge is further compounded by the fact that the curve becomes tighter the nearer to the center of the roundhouse the furniture is positioned. 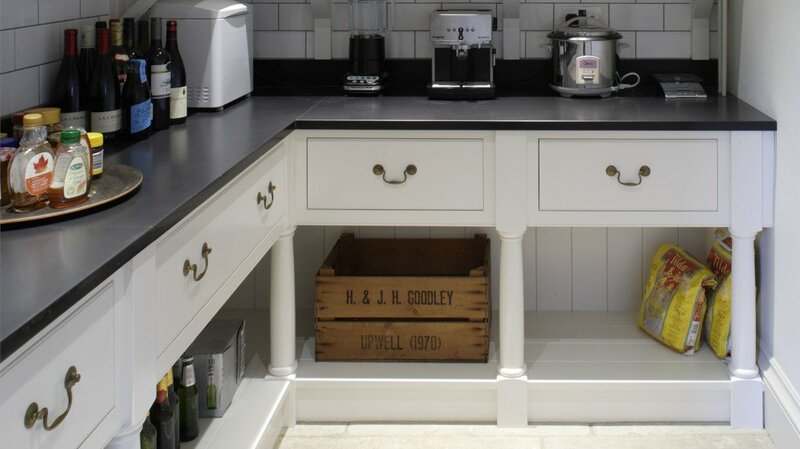 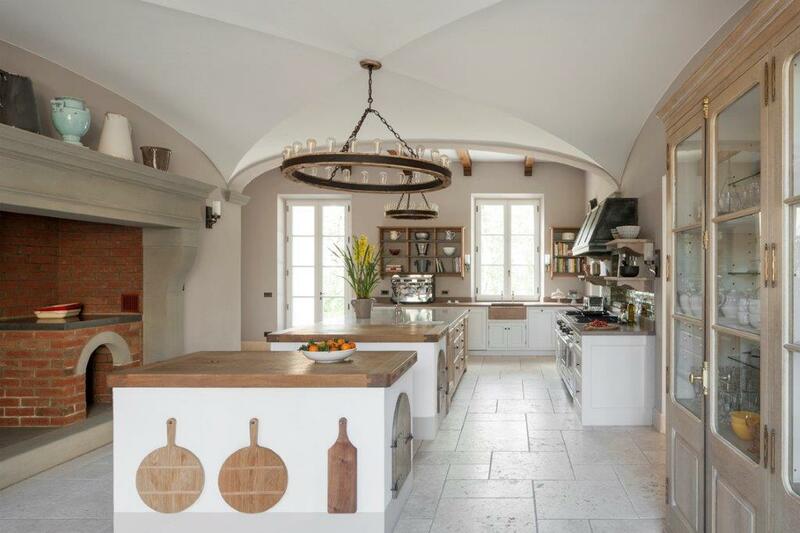 This means that the radius of the furniture doors in the scullery at the back of the kitchen is different (shallower) to the radius of the doors on the outside of the island (tighter). 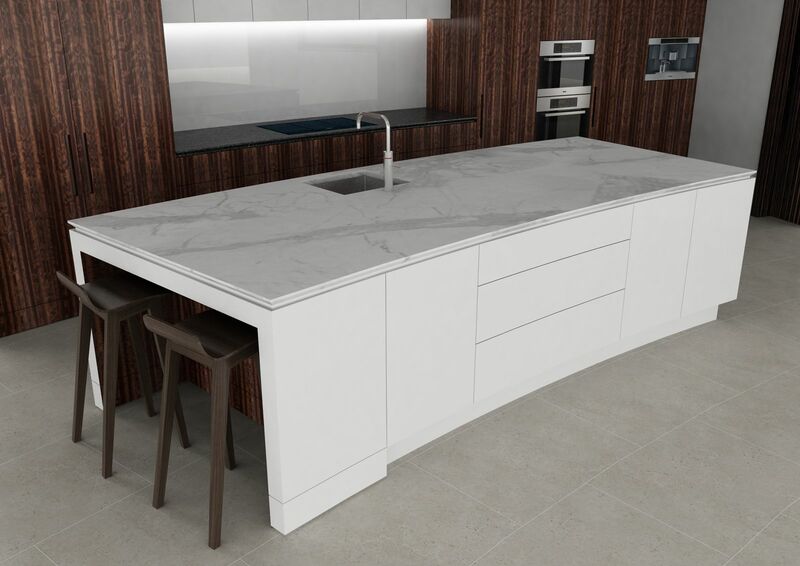 Radius dimensions are 16.16 metres for the scullery, 15.32 for the glass splashback, 14.62 for the main kitchen furniture, 13.49 for the inside of the island and 12.09 for the outside of the island. 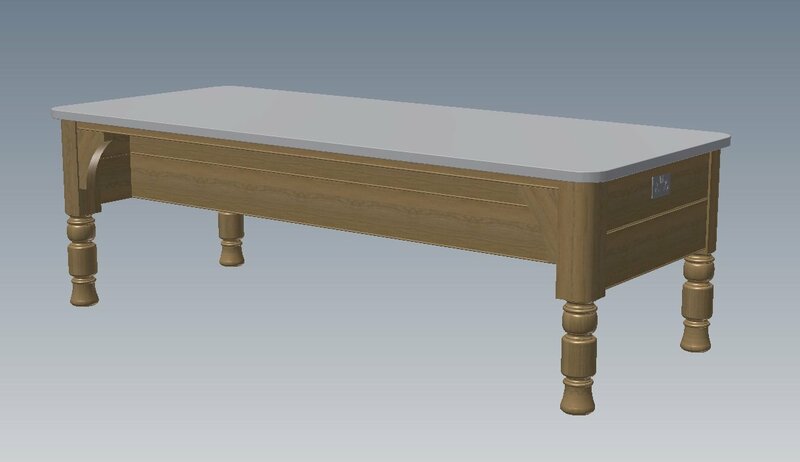 In addition to the varying radius dimensions, other challenges present themselves. 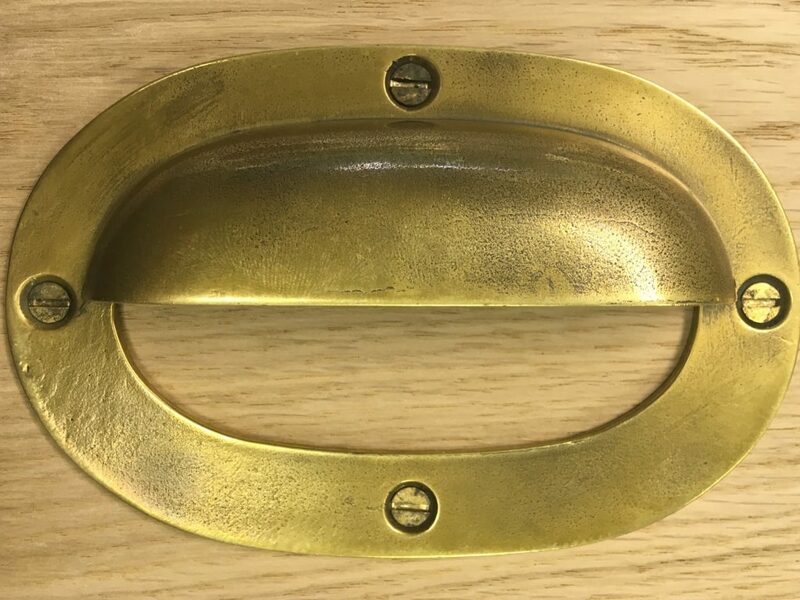 Dishwashers and fridges have flat doors, raising the question of how you fix a curved furniture door to the face of a flat metal door? 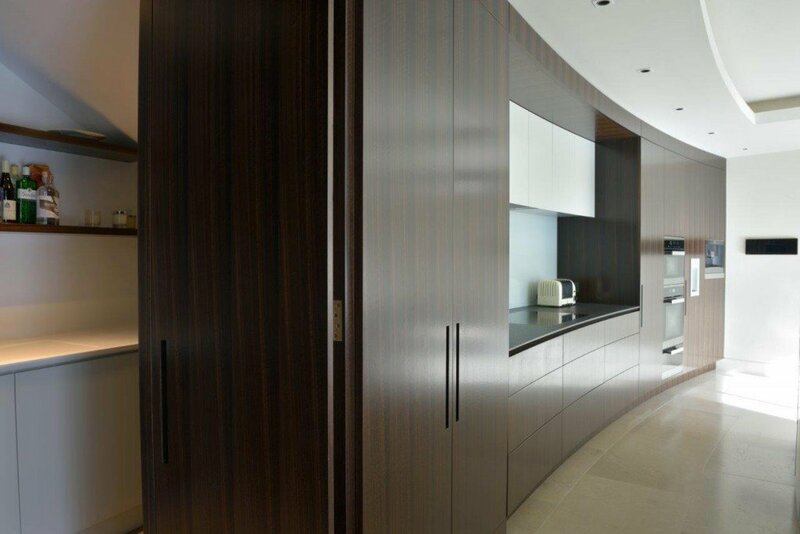 Does the hinge on the appliance throw the curved door out far enough so that it doesn’t meet adjacent doors? 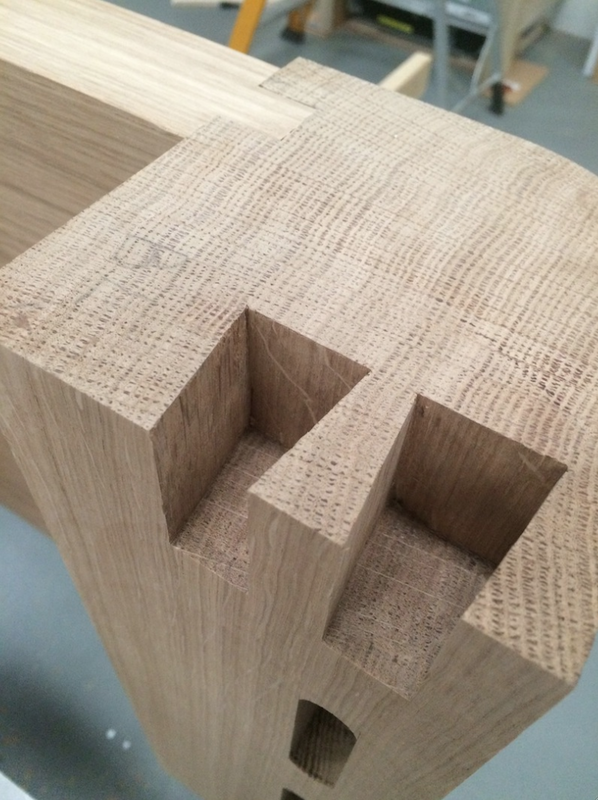 Hardly any of the joints meet at 90 degrees. 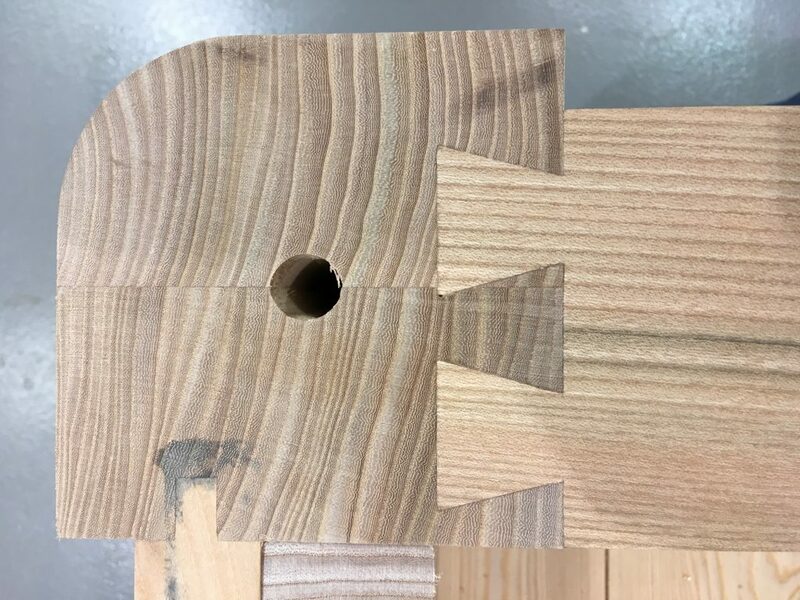 How do you clamp these items together at an angle? 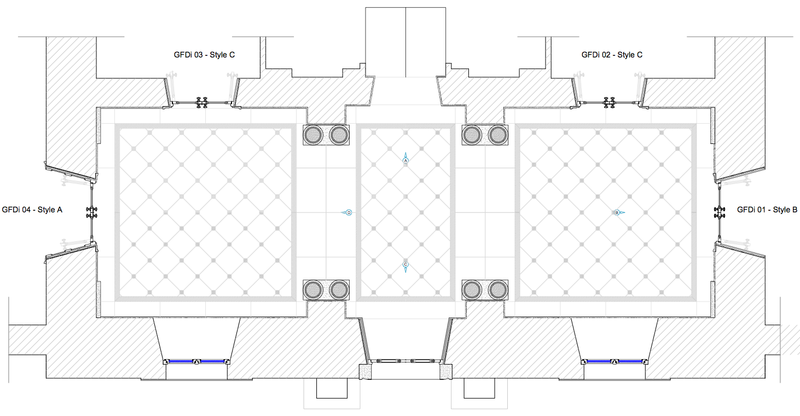 Are the floor tilers using the same radius as you and will their floor radius match your plinth radius? 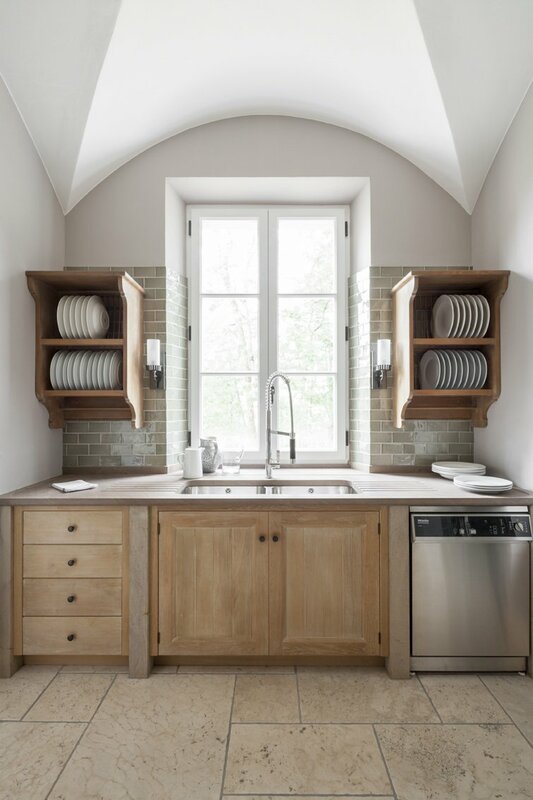 The glass backsplash needs to be specially curved. 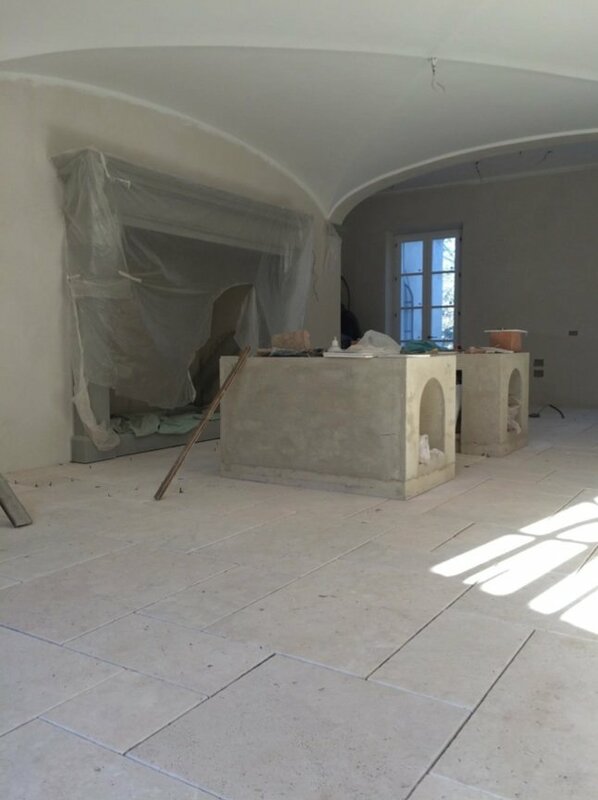 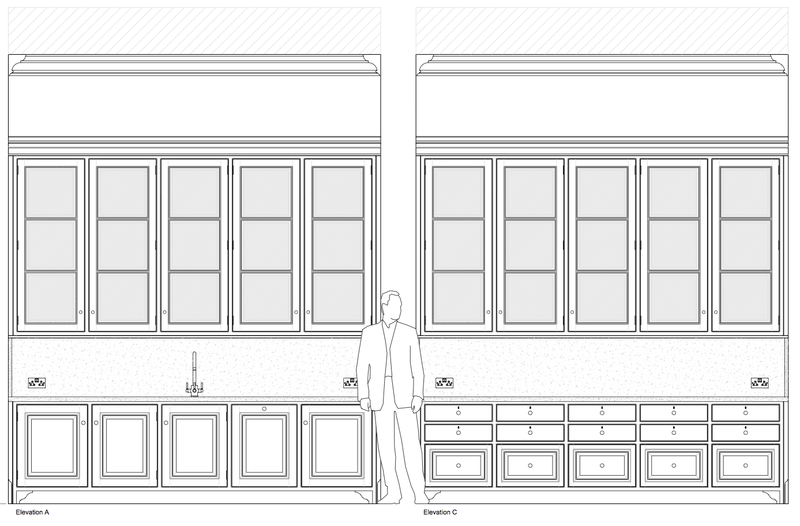 How do you set out the kitchen at the installation stage? 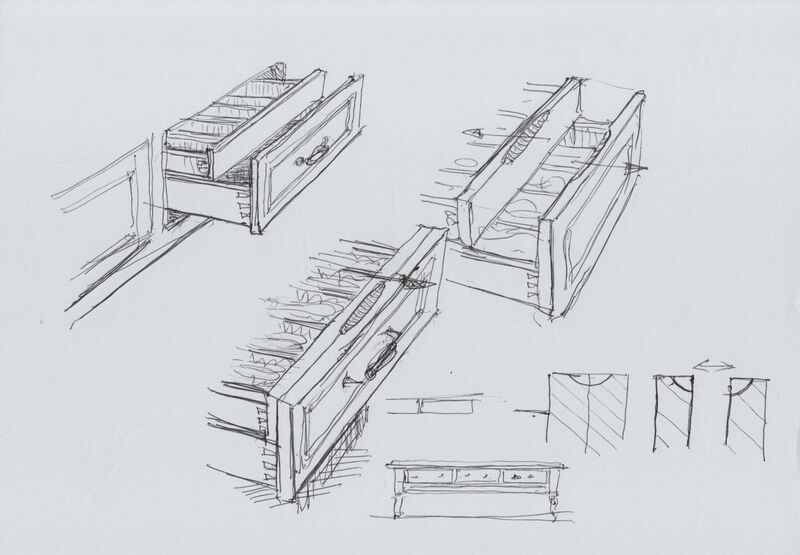 Artichoke’s creative design images of the desk area with doors open and closed. 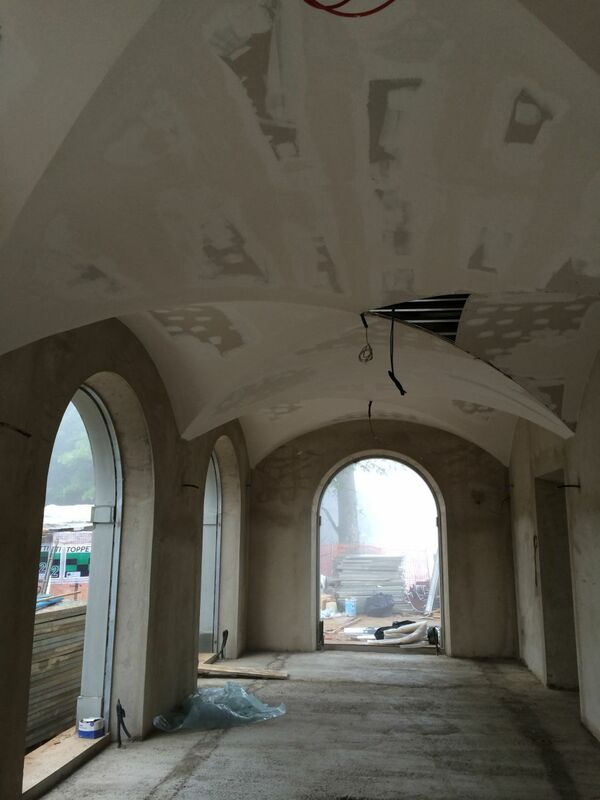 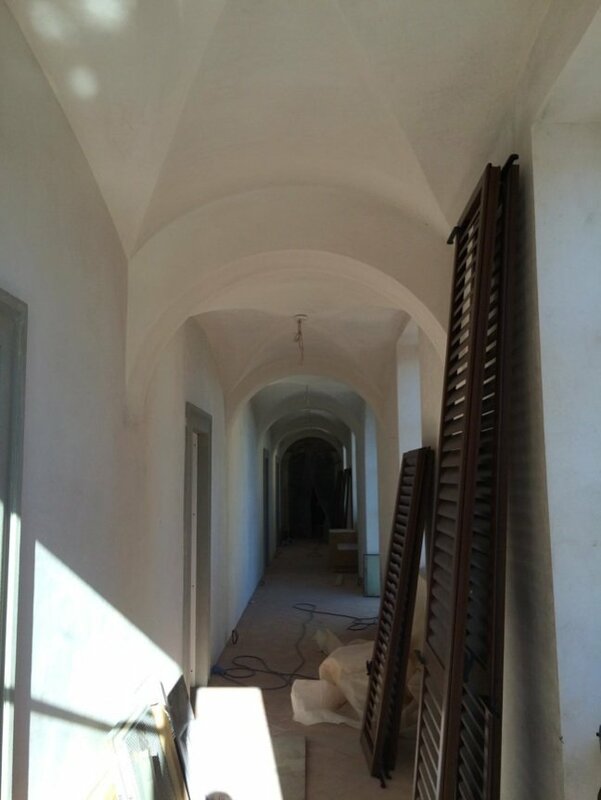 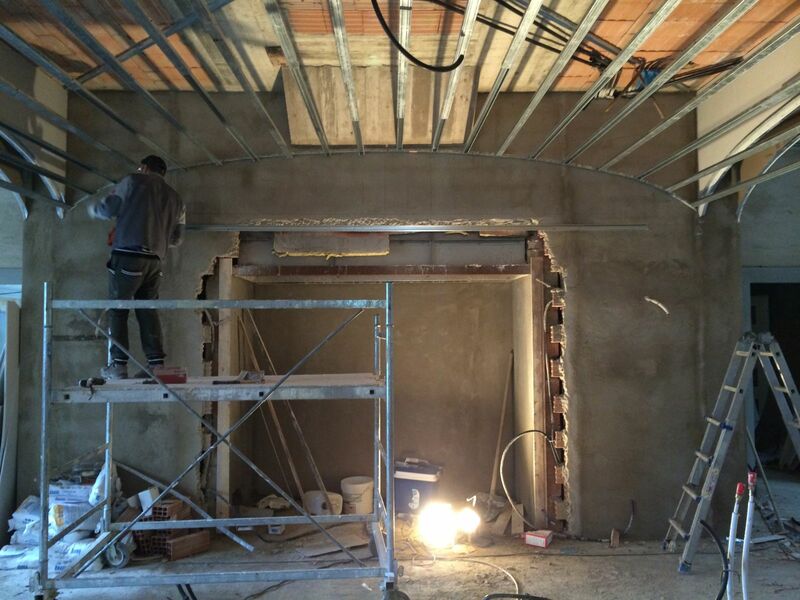 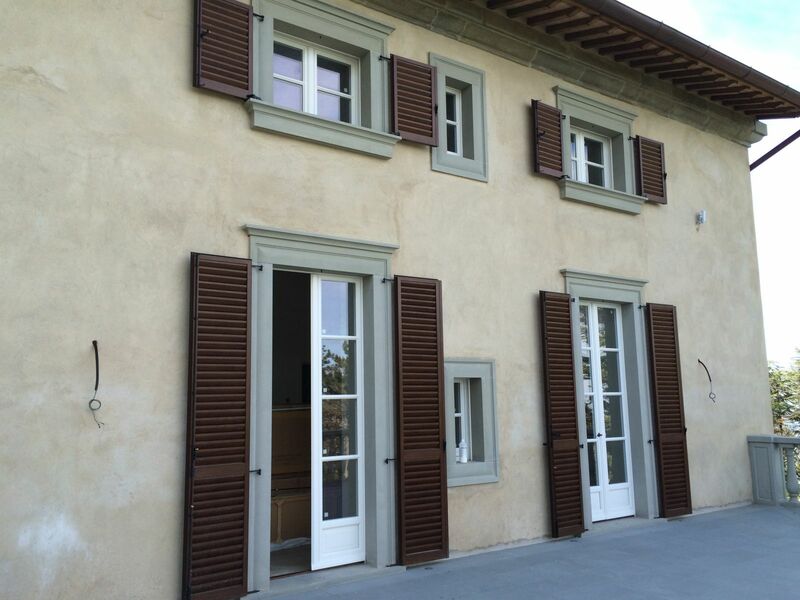 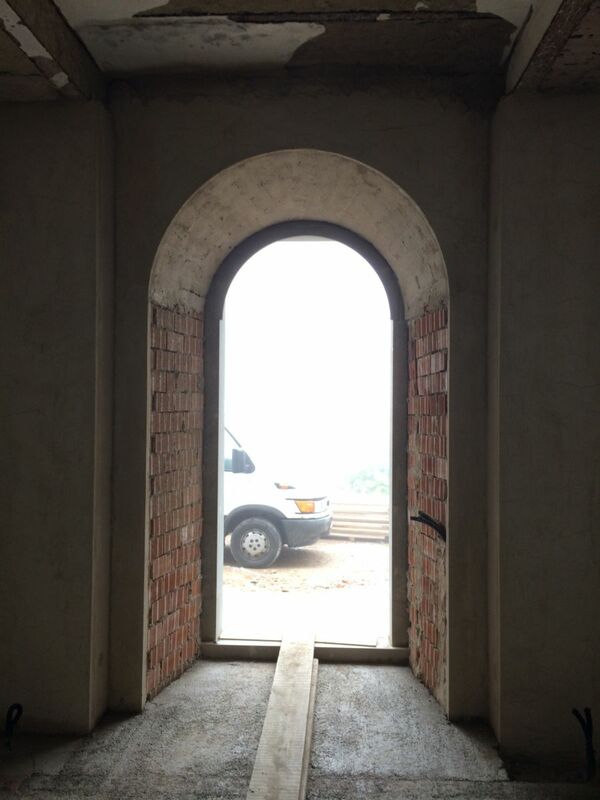 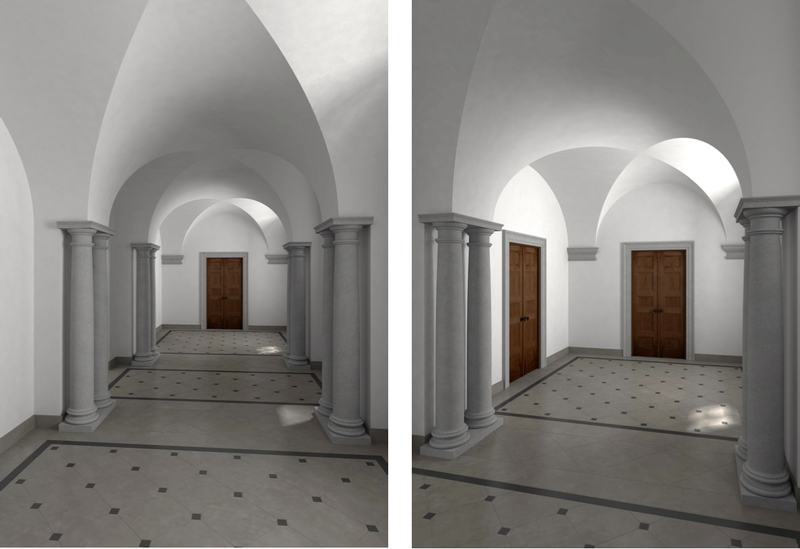 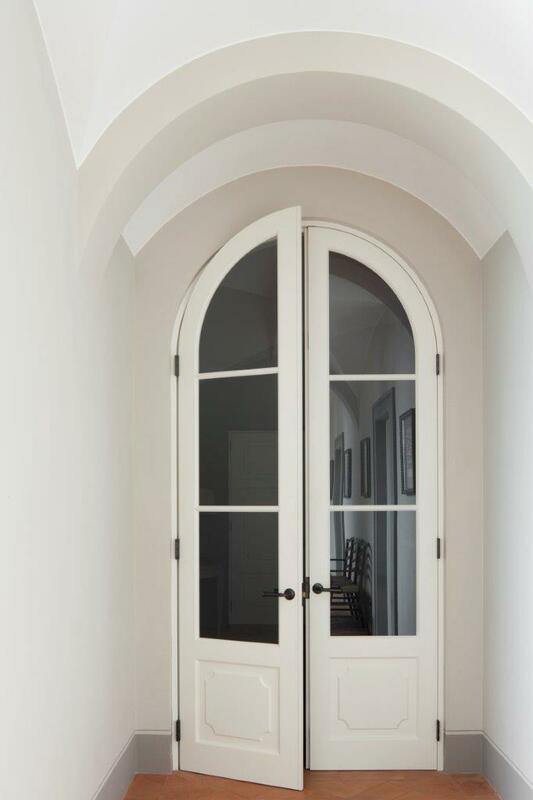 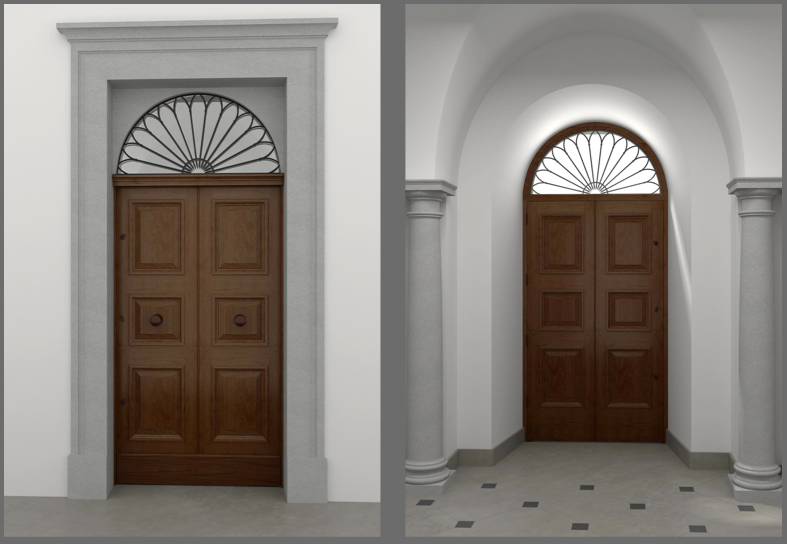 The right hand side of these images show the strength of the curved doors. 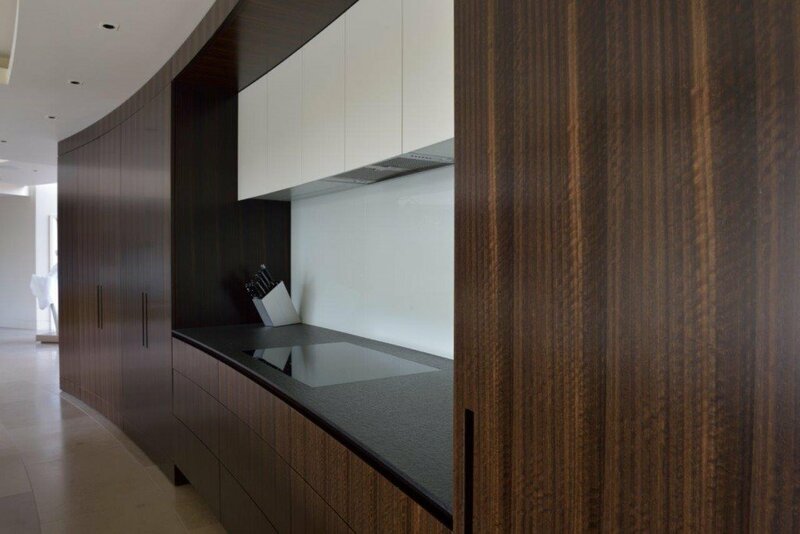 The primary material chosen for this kitchen is fumed Eucalyptus, typically found in Australia, New Zealand and Spain. 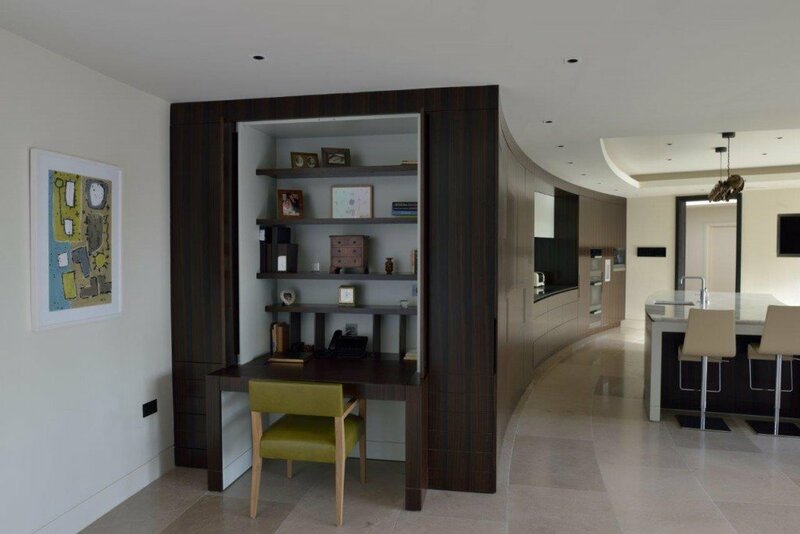 The material is a light brown/golden yellow in its natural state, and it is made to go a deep chocolate brown colour by fuming it (a process using ammonia that causes a reaction with the tannins in the timber). 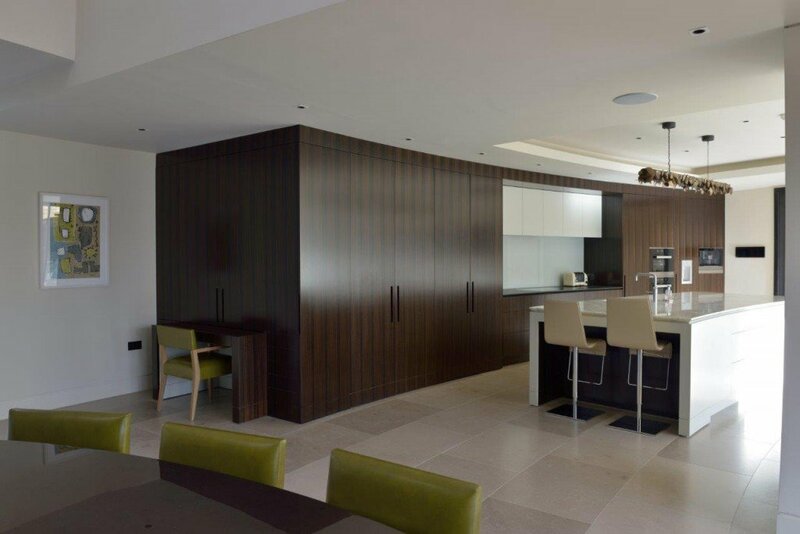 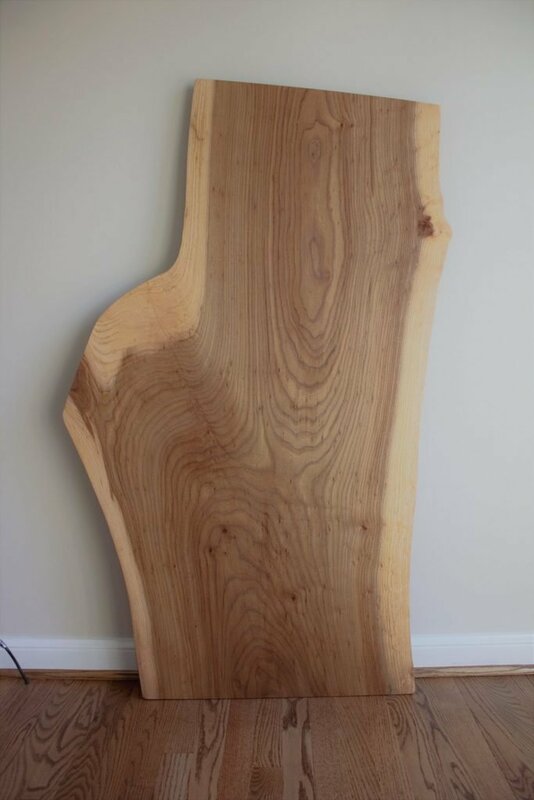 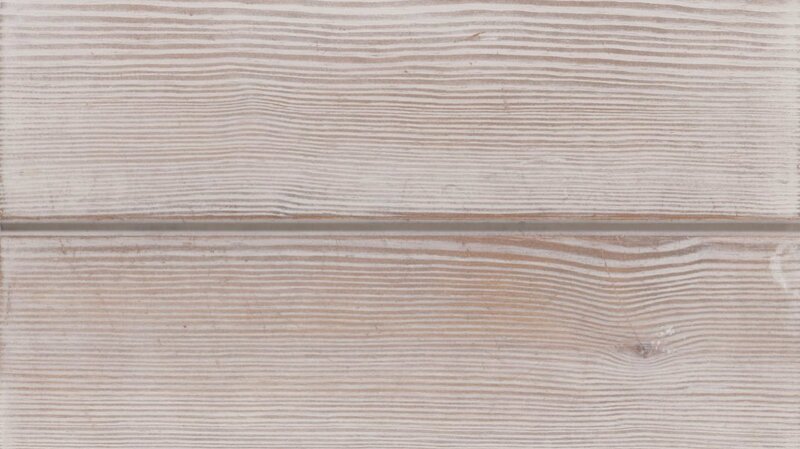 As you can see, the timber has a wonderful ripple running through it and great care and considerable time was chosen to source a pack of veneer that was even in colour throughout and maintained its ripple across the width of the kitchen. 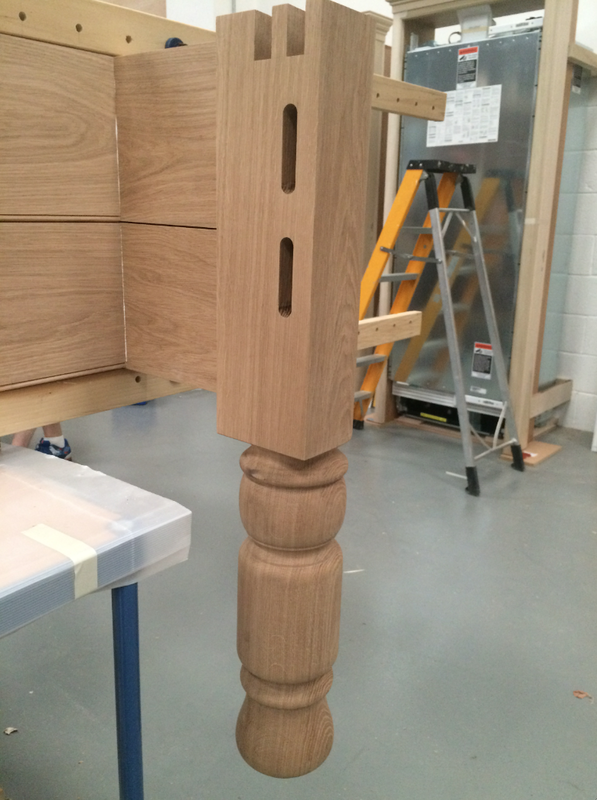 As is often the case, we took the client to our veneer suppliers to advise and discuss the choice. 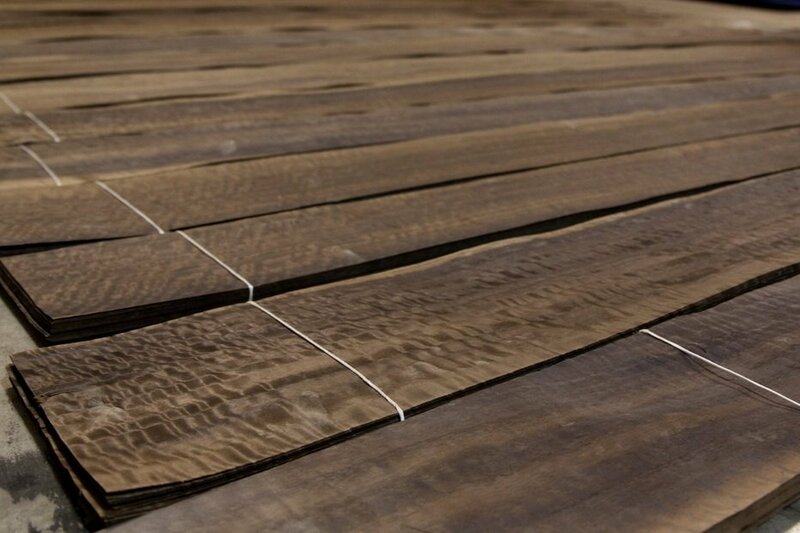 The Fumed Eucalyptus in Artichoke’s workshops before it is worked. 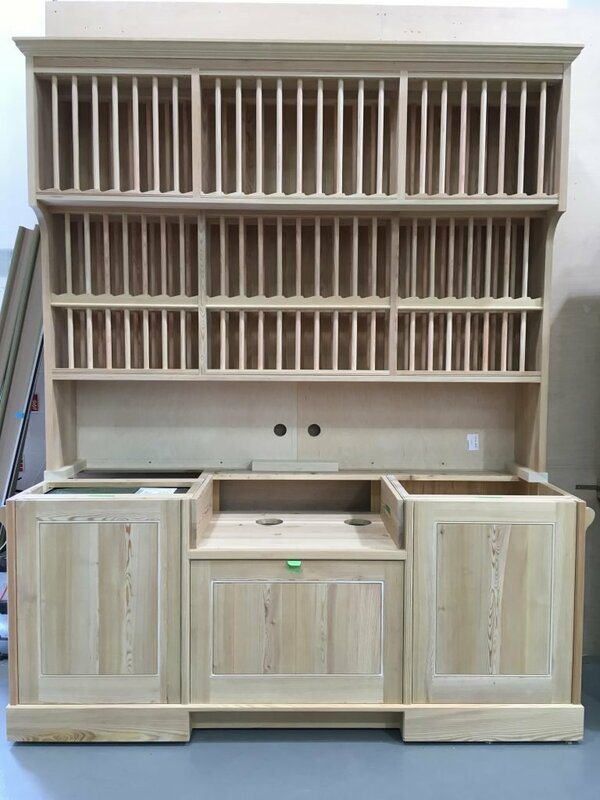 This video shows an Artichoke cabinet-maker bonding veneer onto one of the curved substrates using a vacuum bag-press. 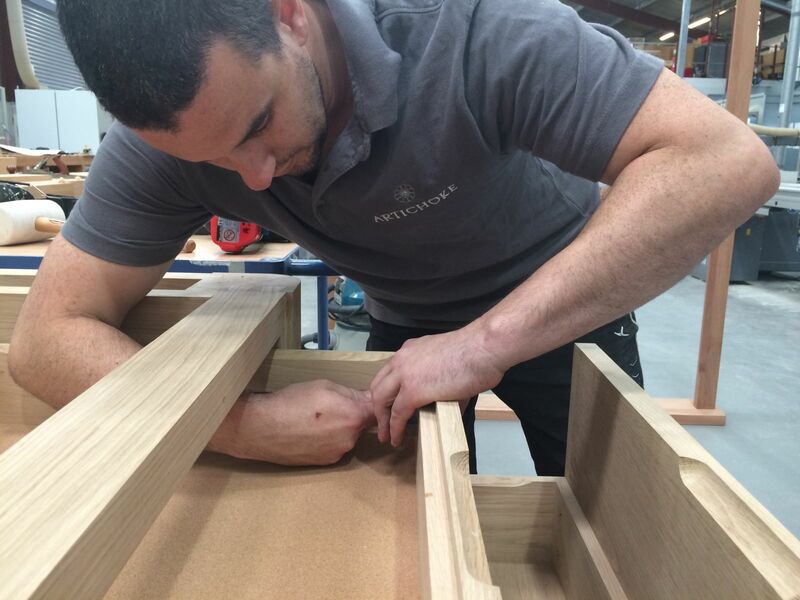 At Artichoke, because our kitchens are so highly bespoke, we put every completed design through a process called Production Engineering. 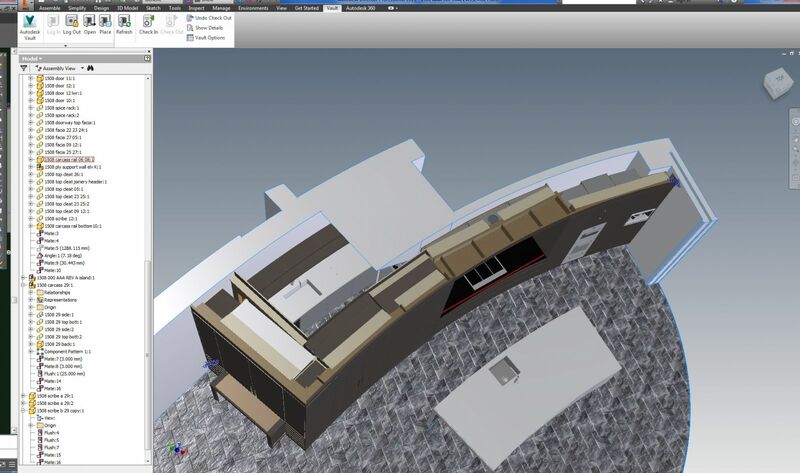 This essentially means we are making the kitchen digitally into an accurately surveyed wire-frame model of the room. 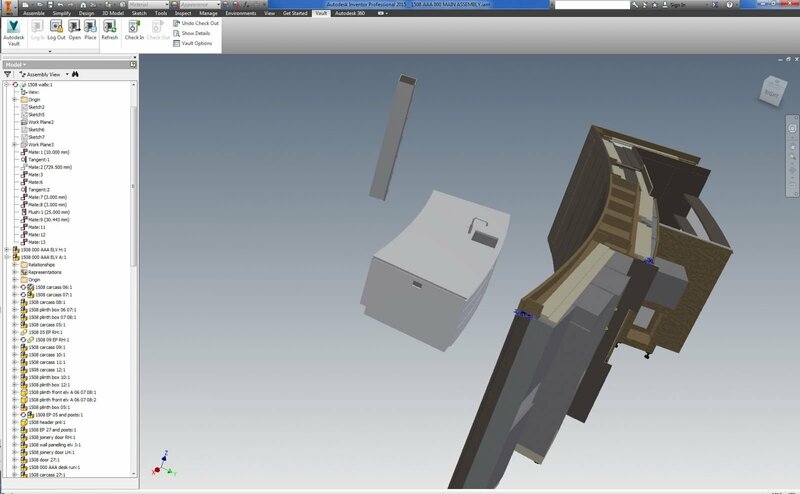 This allows us to iron out every issue on computer first before any materials are purchased. 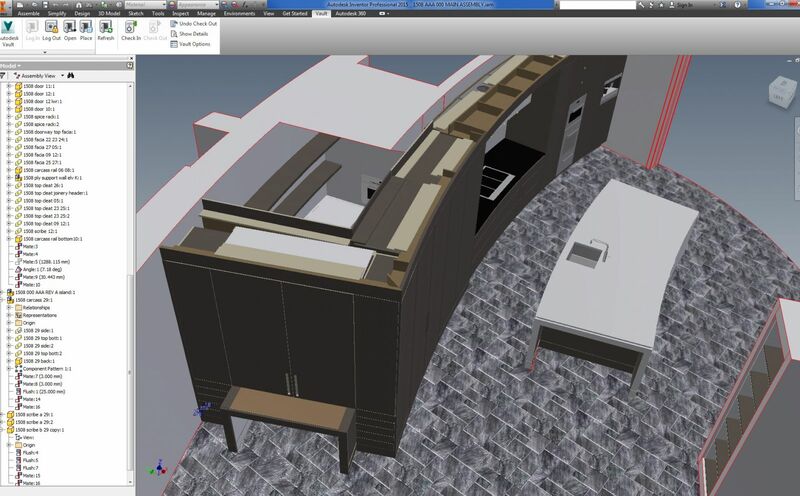 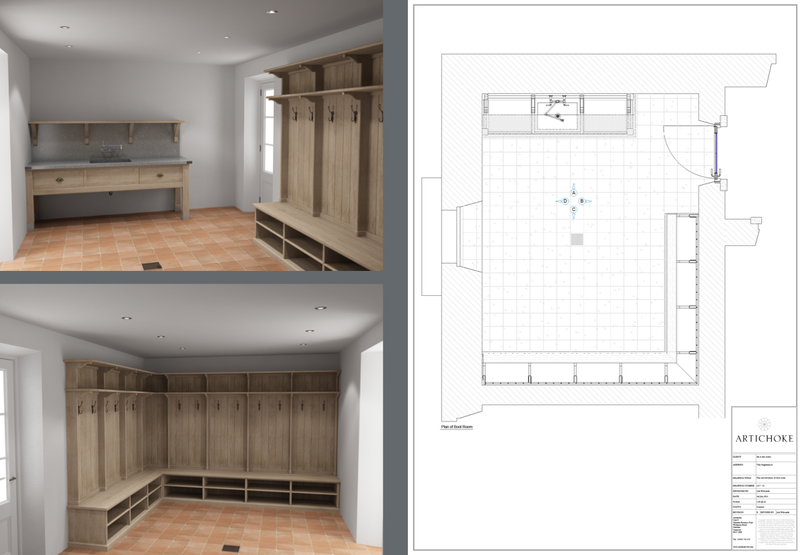 Images show the kitchen being digitally cabinet-made into the wire frame model of the room. 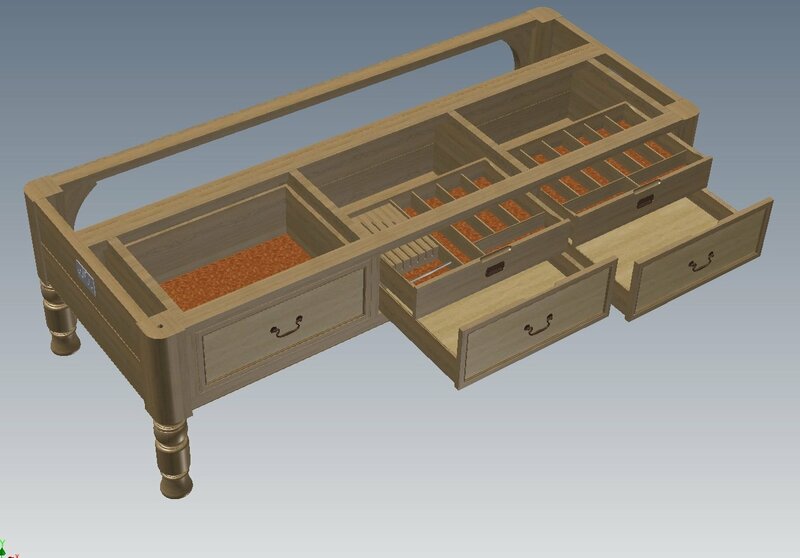 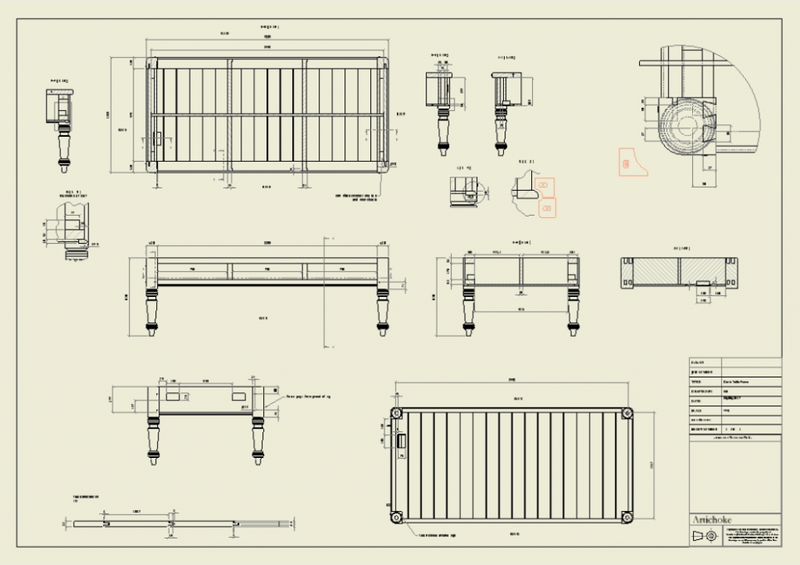 Once this process is complete and we are happy the kitchen works, we can use this software to produce making drawings for the cabinet-makers. 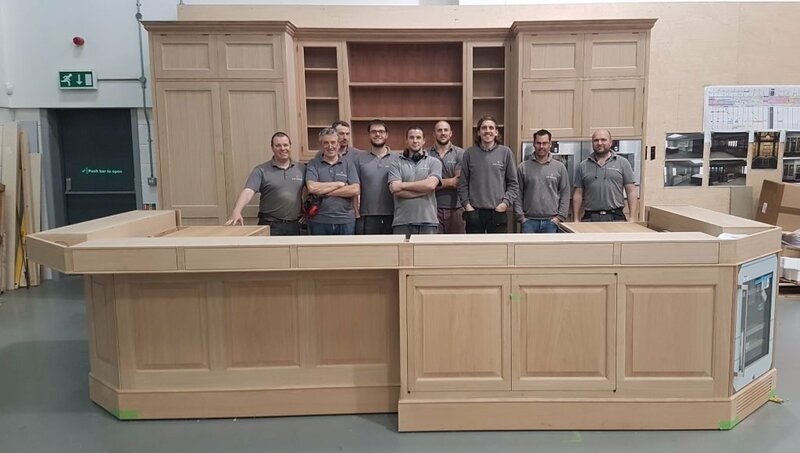 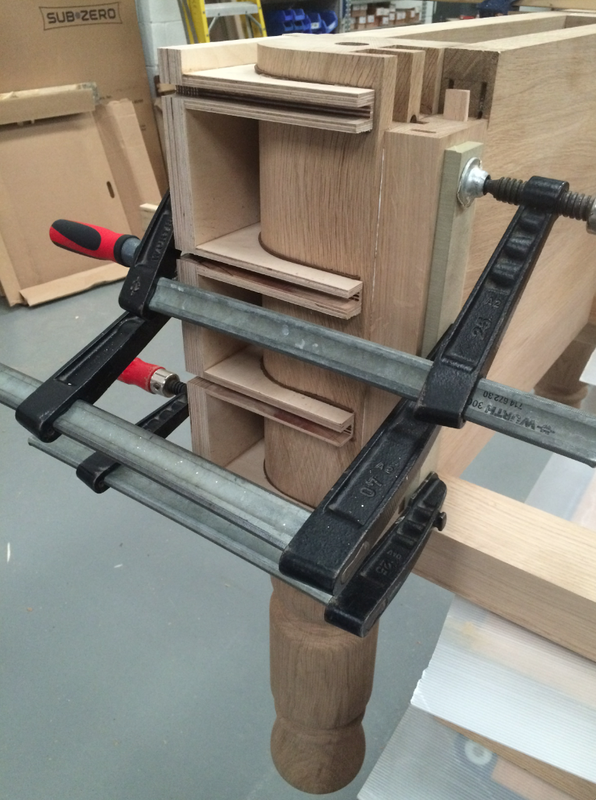 For quality control reasons, every bespoke kitchen we design is assembled at Artichoke’s workshops to ensure any issues are ironed out before we come to the installation phase. 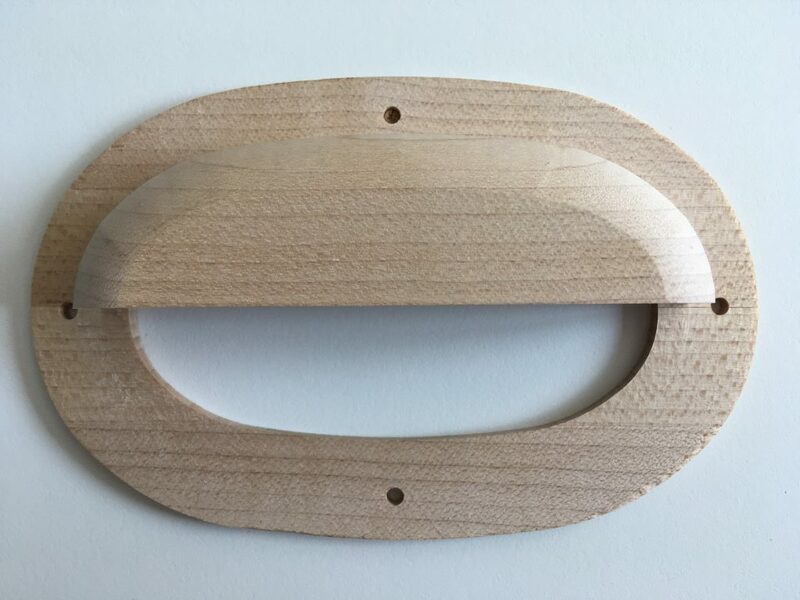 This also gives us the opportunity to ensure that all of the appliances fit perfectly and that all of the door gaps are perfect. 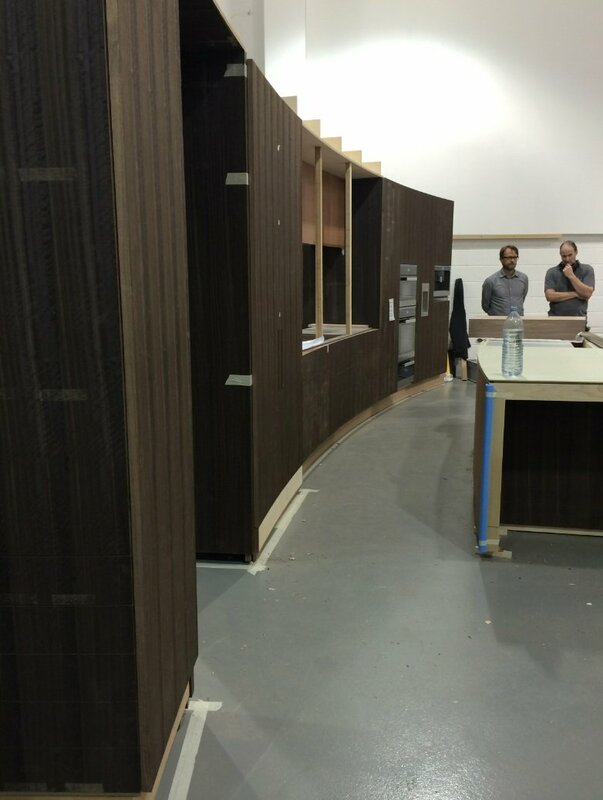 Only then is the kitchen dis-assembled and finished in Artichoke’s high tech, air filtered finishing booths. 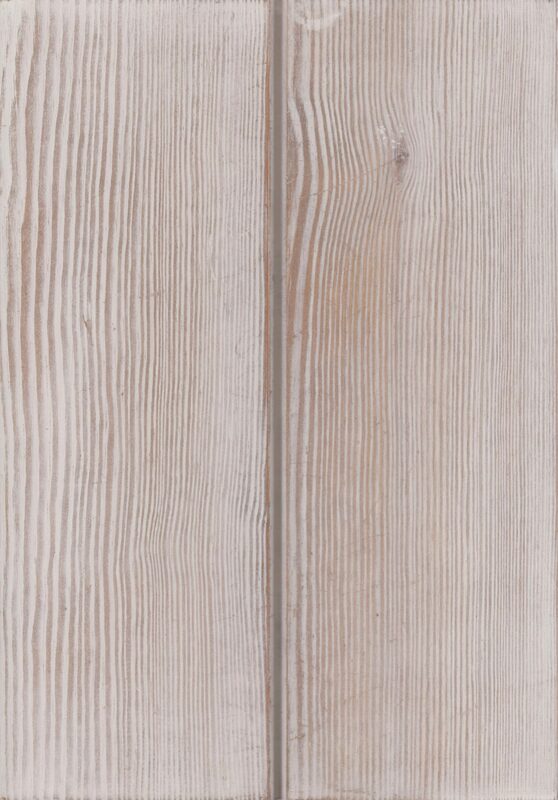 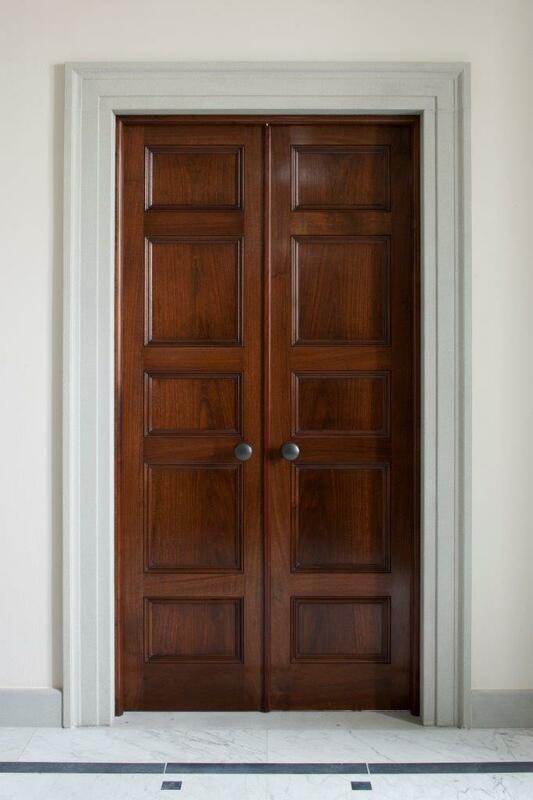 Individually, the curve on each door is surprisingly slight, but when compounded it becomes more pronounced. 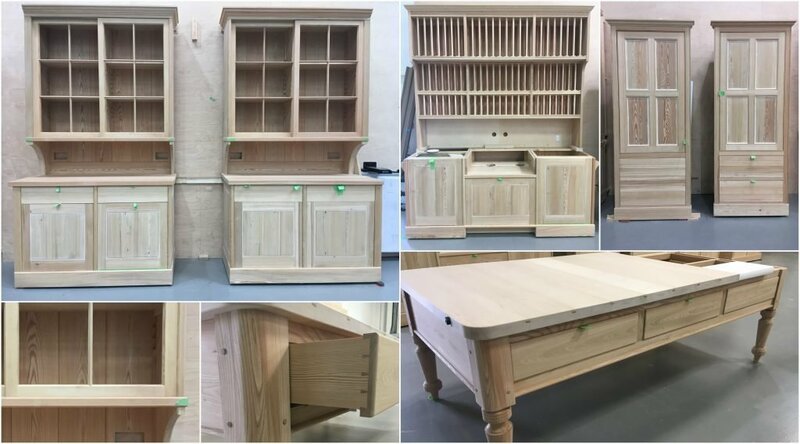 Artichoke’s workshop environment is specifically set to domestic heat and humidity levels, so moving completed furniture into a non domestic environment is a potential danger. 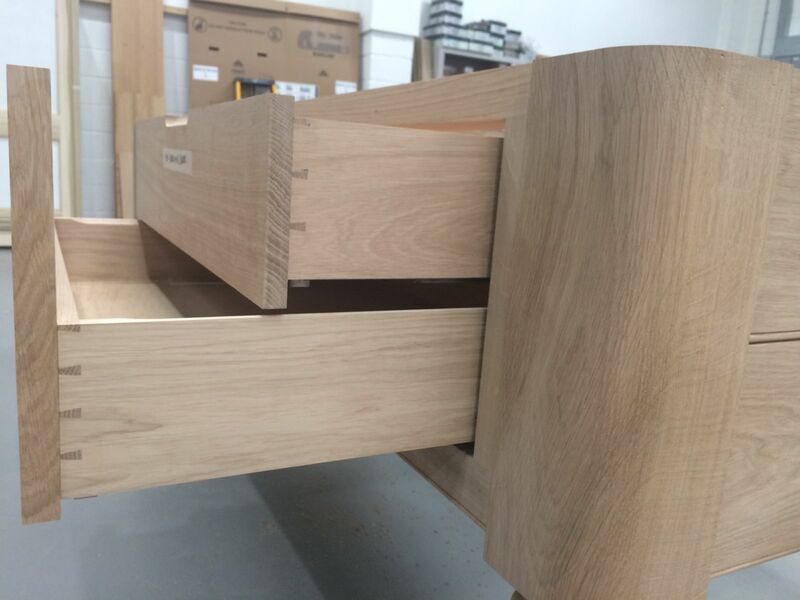 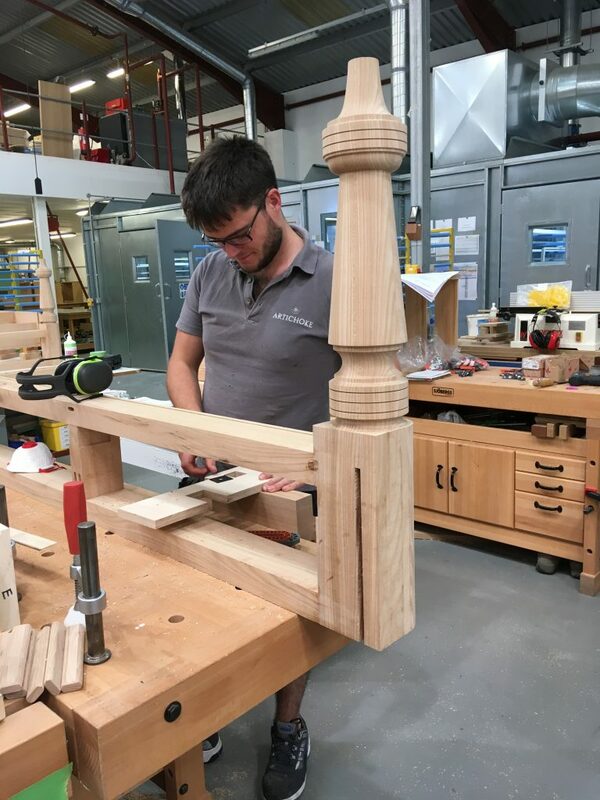 The installation phase is often the most risky, and we take great care to ensure that our furniture is introduced to the building at the correct stage of the build. 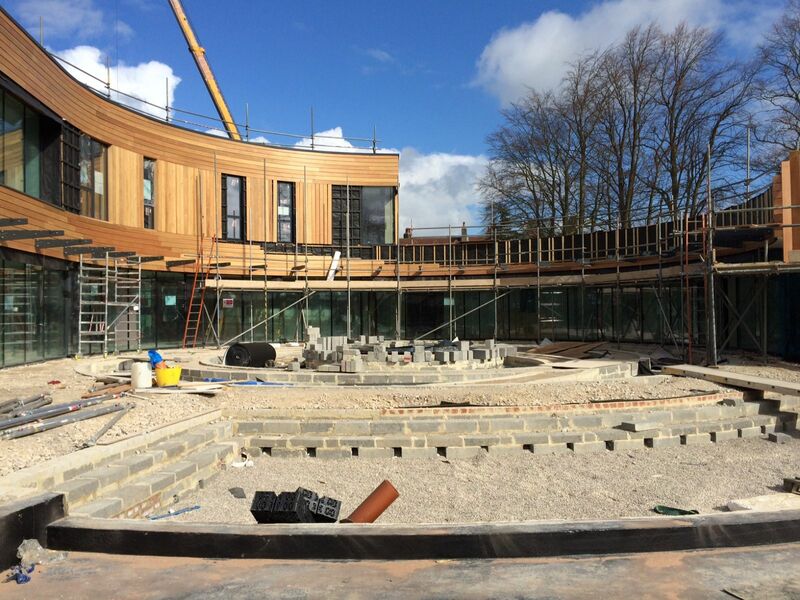 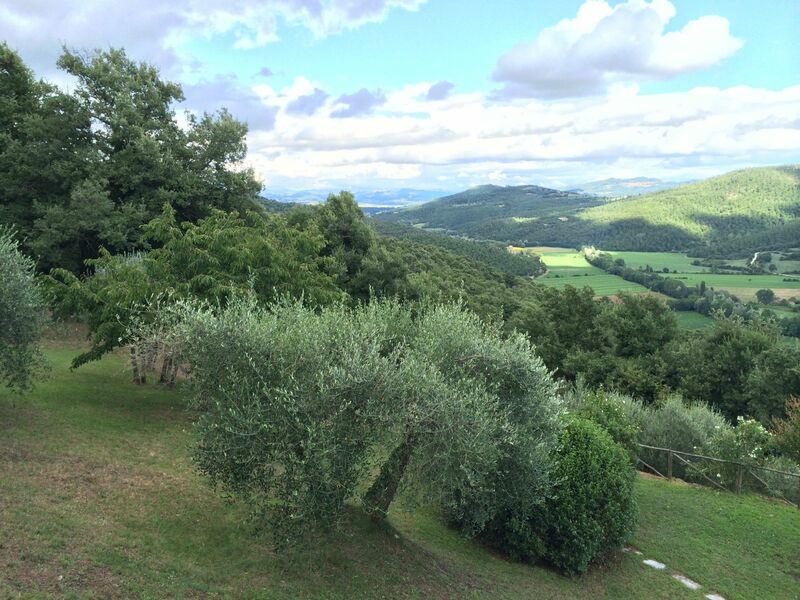 We are particularly focussed on ensuring the relative humidity is appropriate (between 40 and 60%). 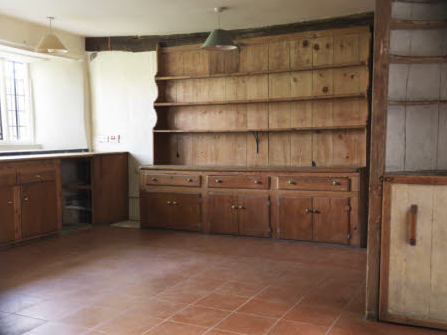 If humidity levels are under, it can cause the timber in the kitchen to shrink, causing cracking, gapping and surface checking. 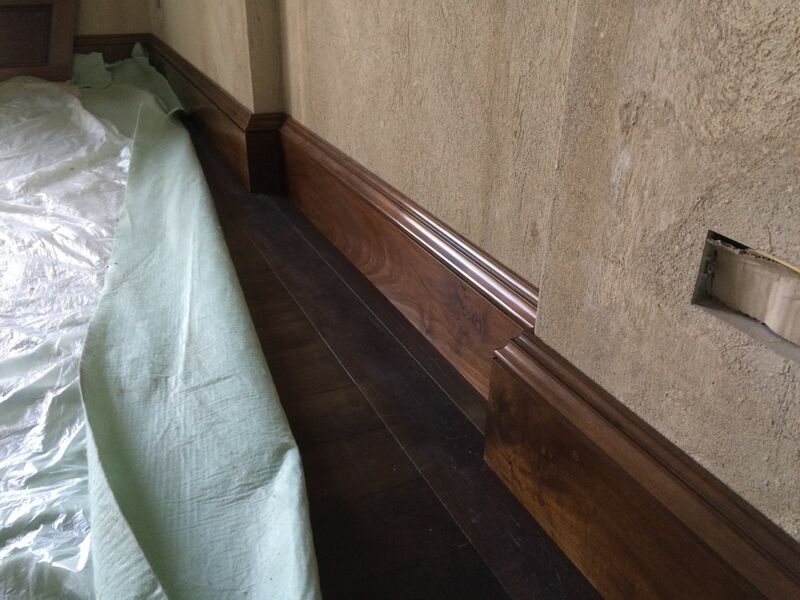 If the humidity levels are above (which can be as a result of plasterers still working on the site), then it can encourage mould growth and buckling. 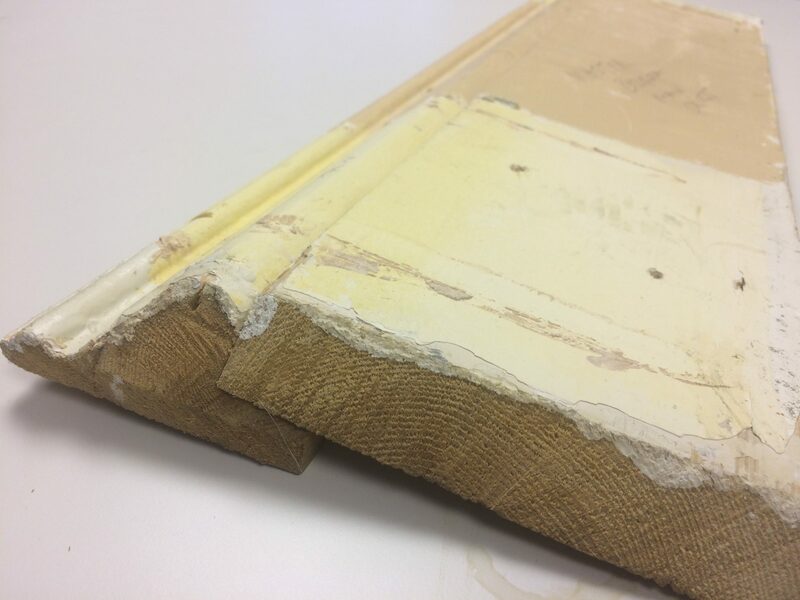 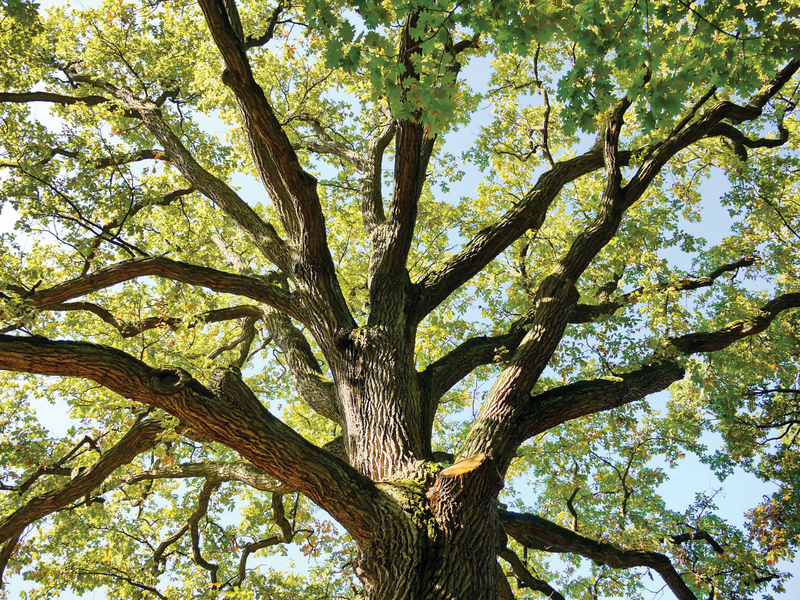 Solid timber is particularly vulnerable. 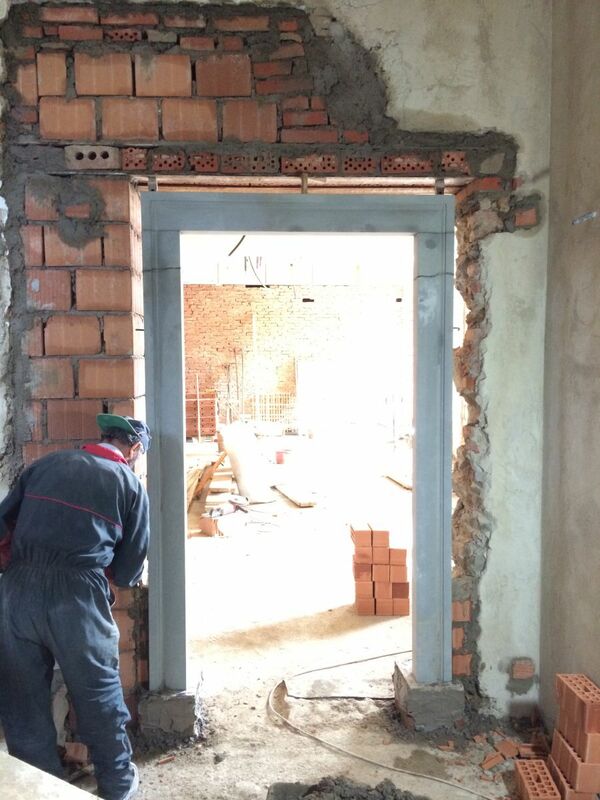 The double doors lead to the scullery. 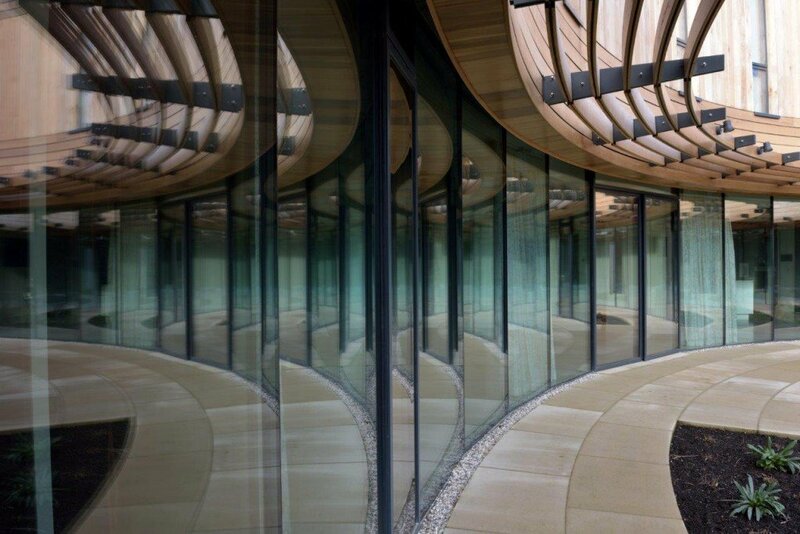 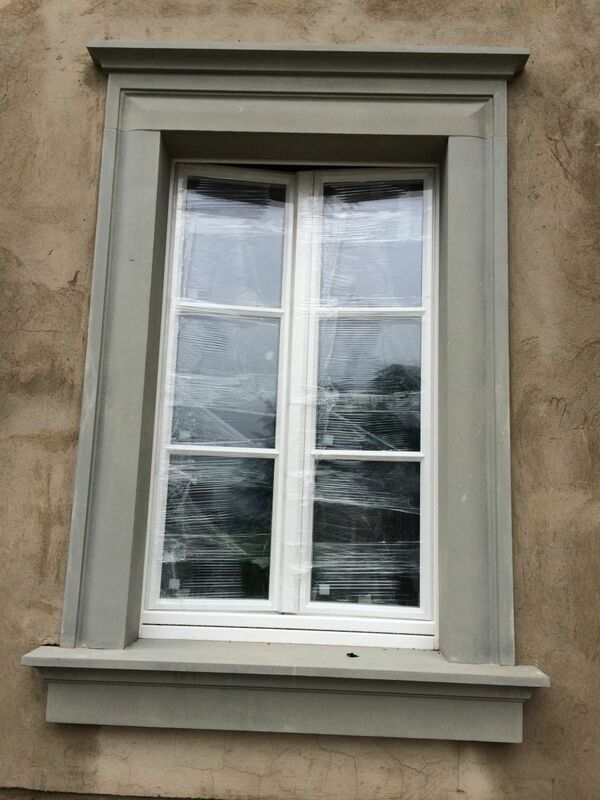 The glass was also curved, as was the stone profile. 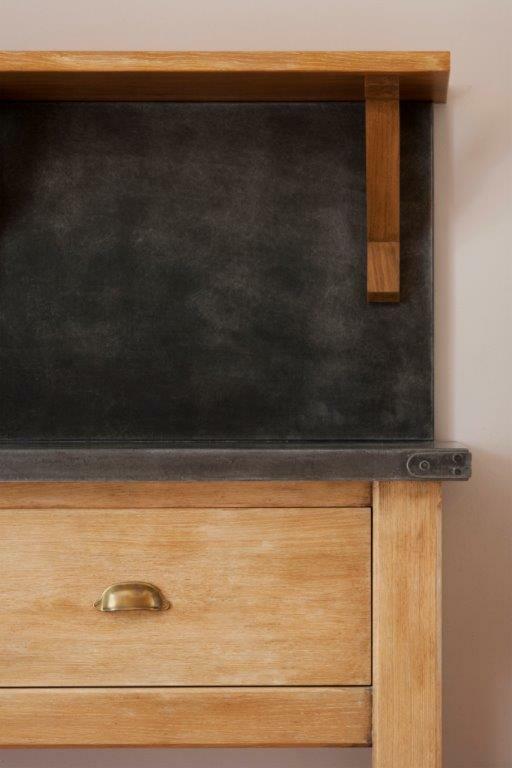 The stone has a textured surface. 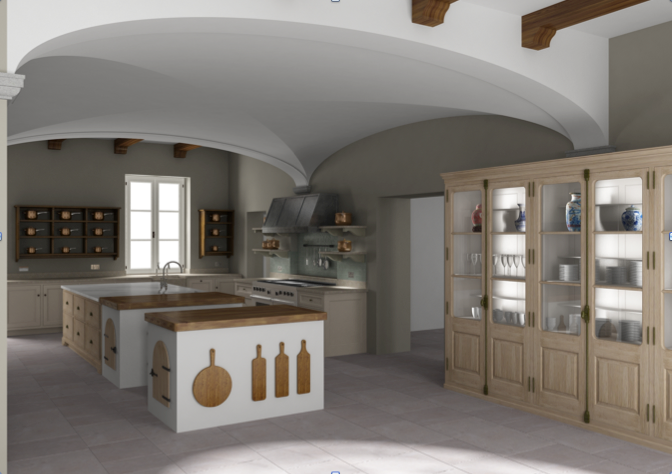 If you are interested in curved kitchen design and would like to discuss a project with us, please contact Andrew or Bruce on +(0)1934 745270.